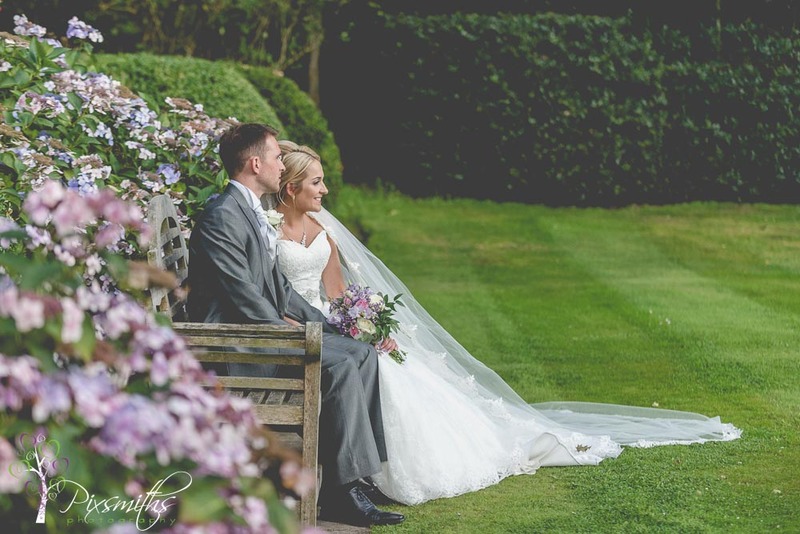 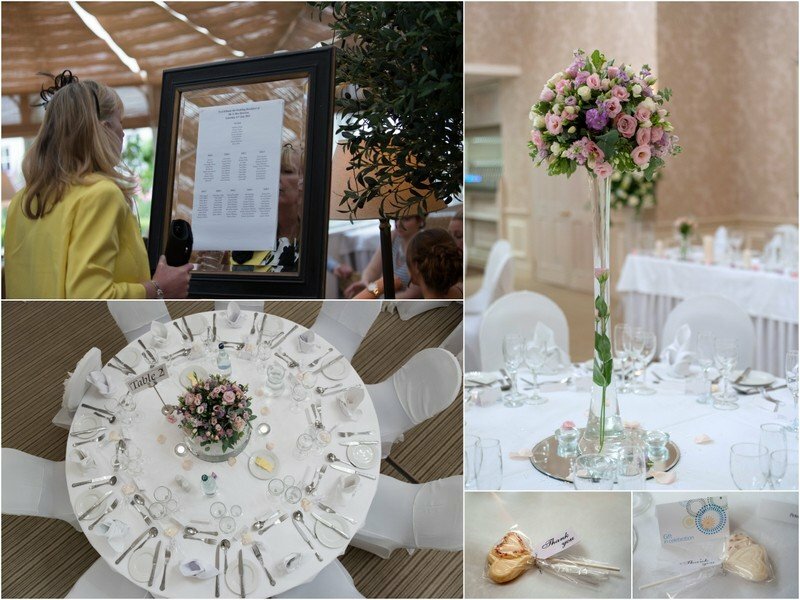 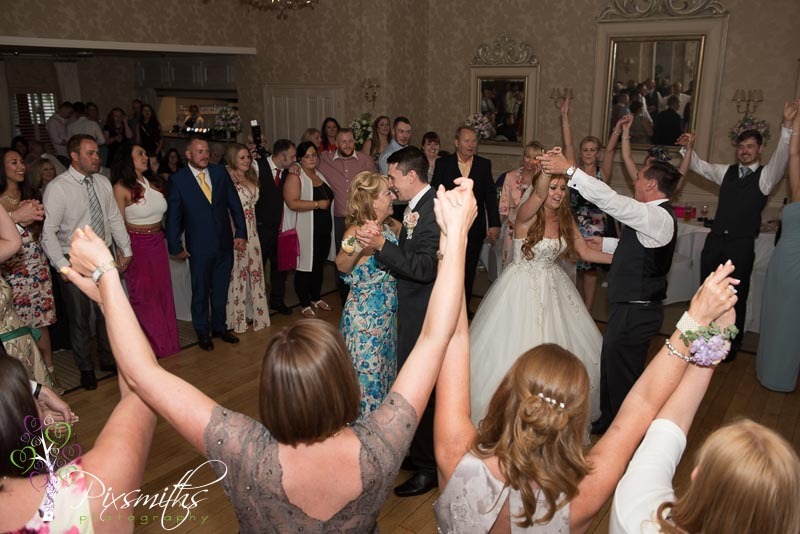 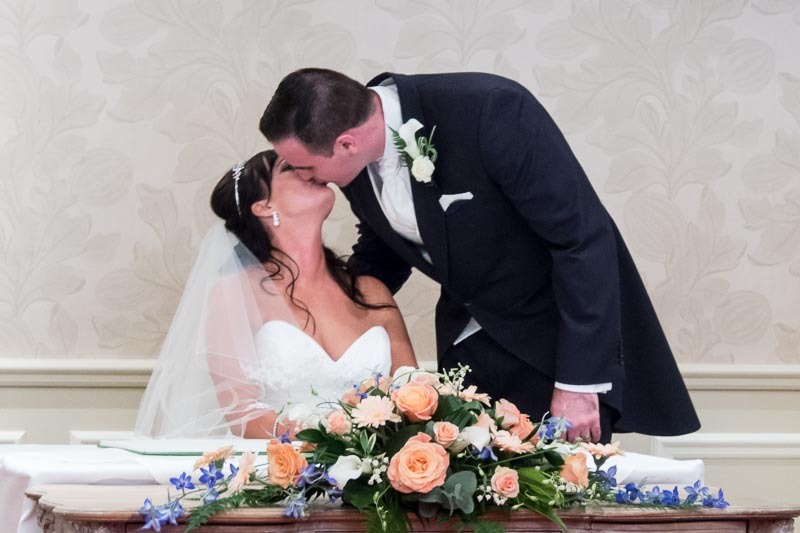 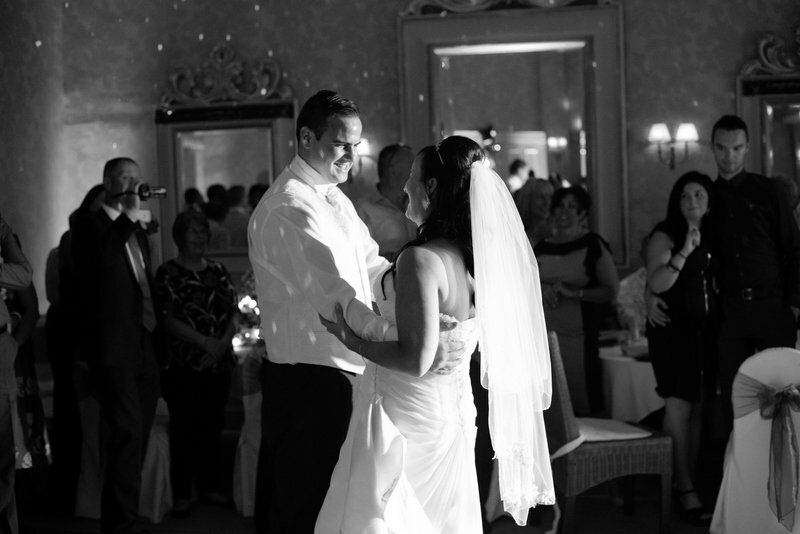 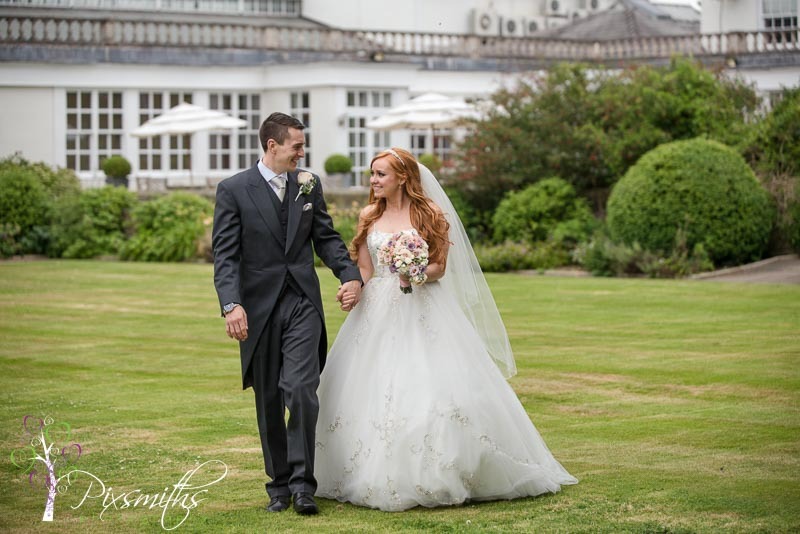 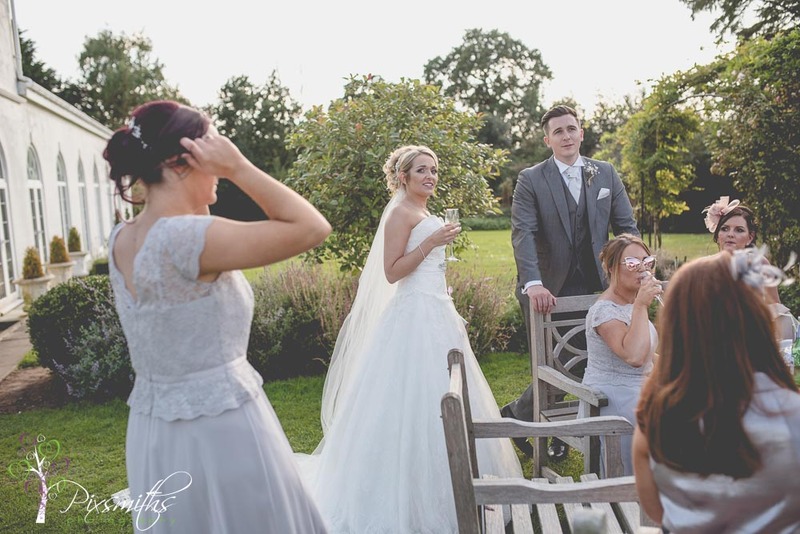 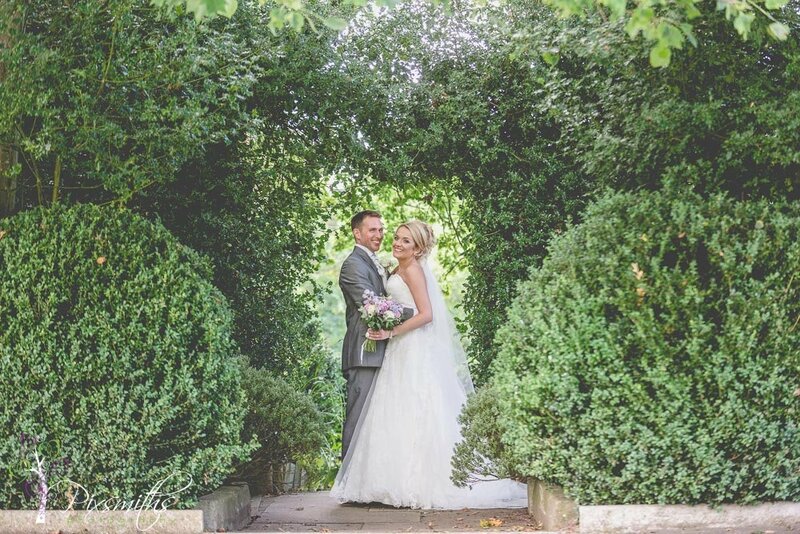 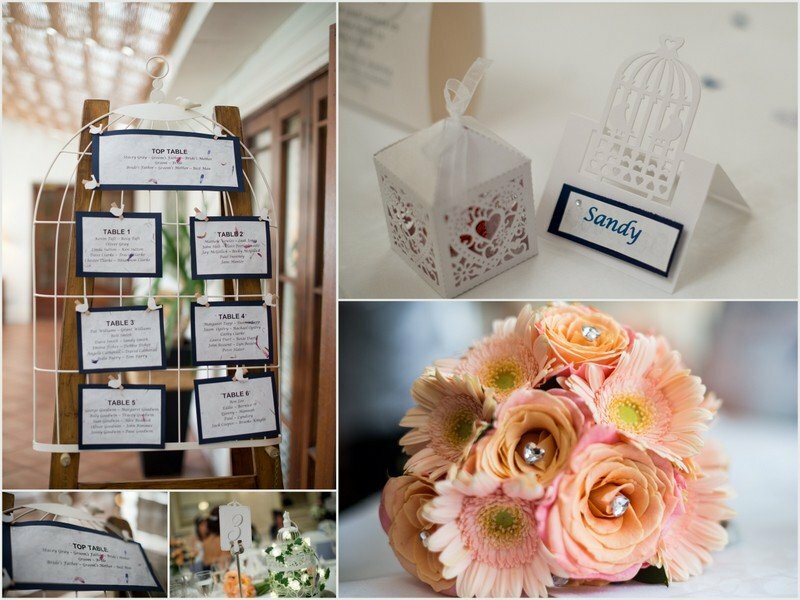 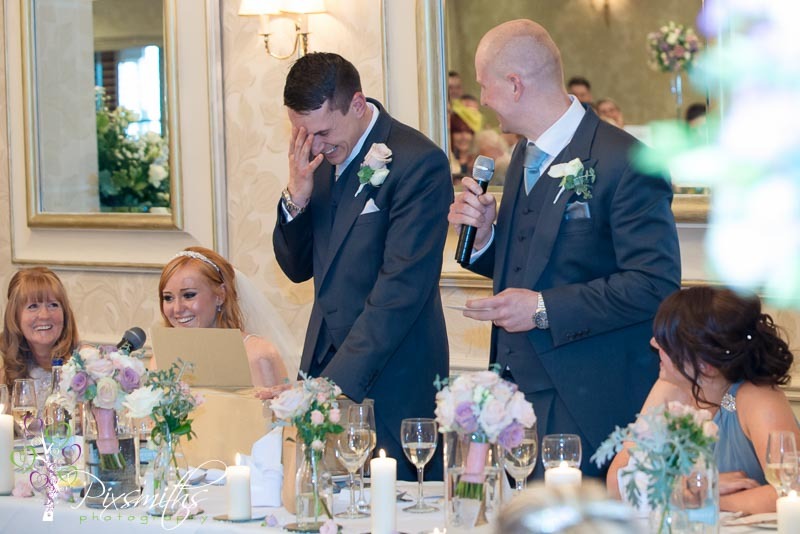 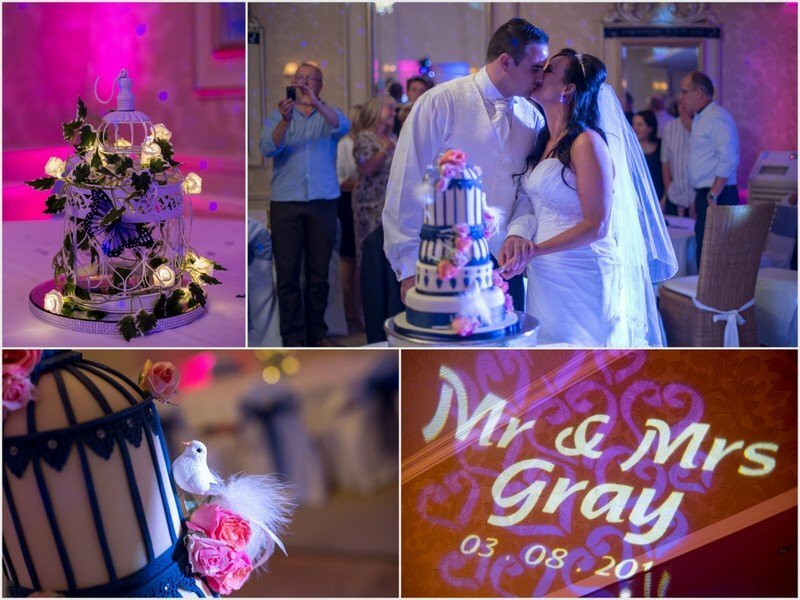 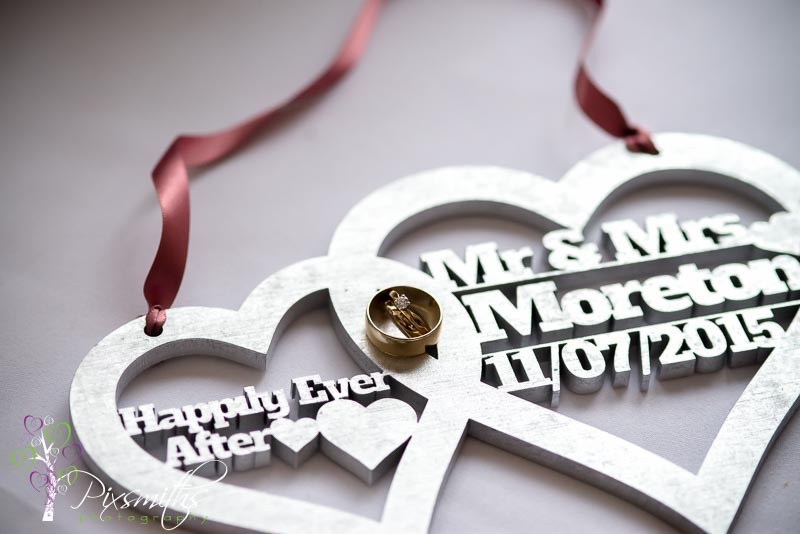 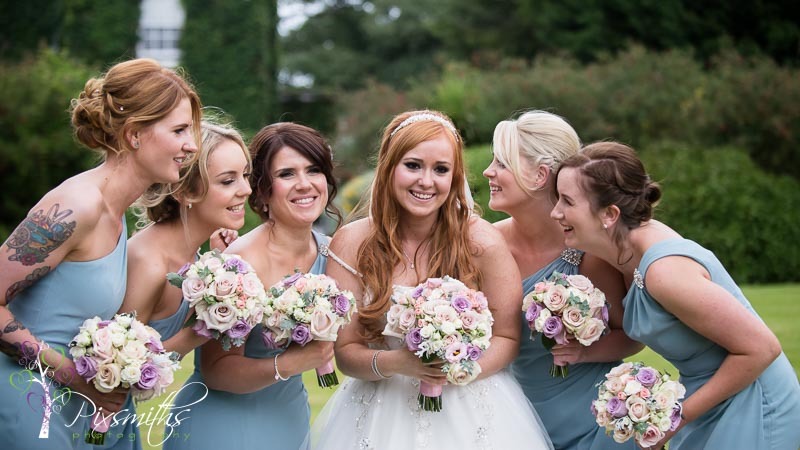 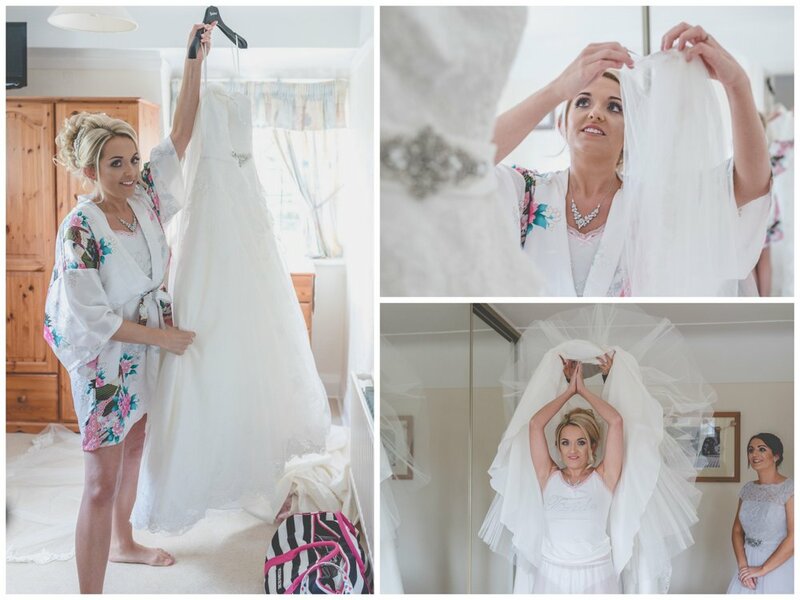 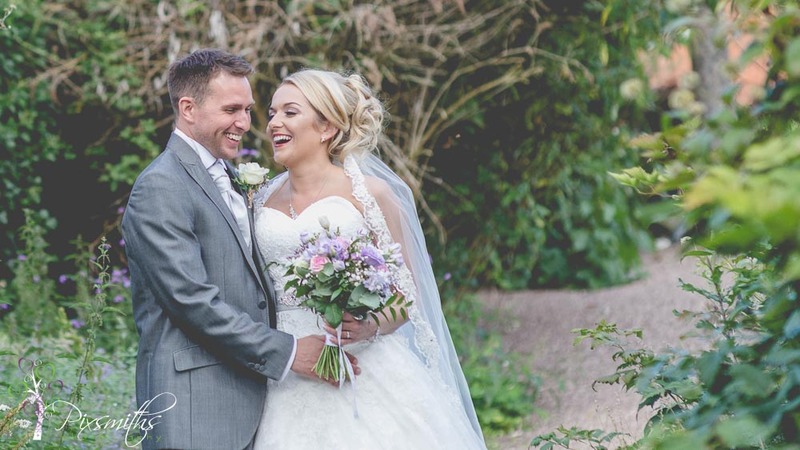 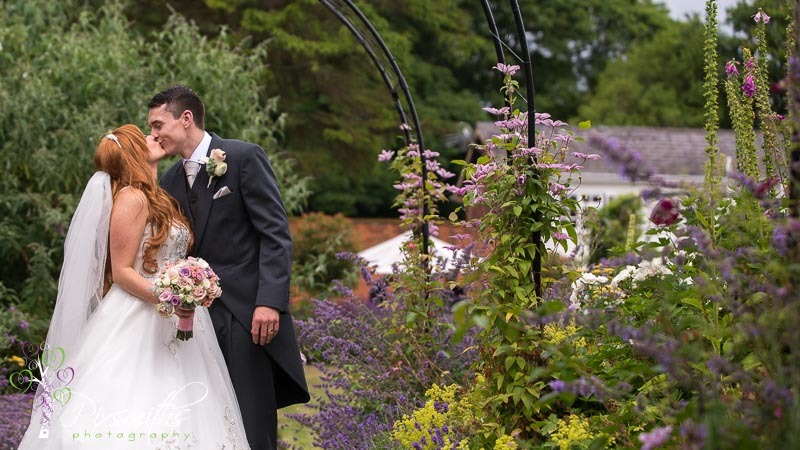 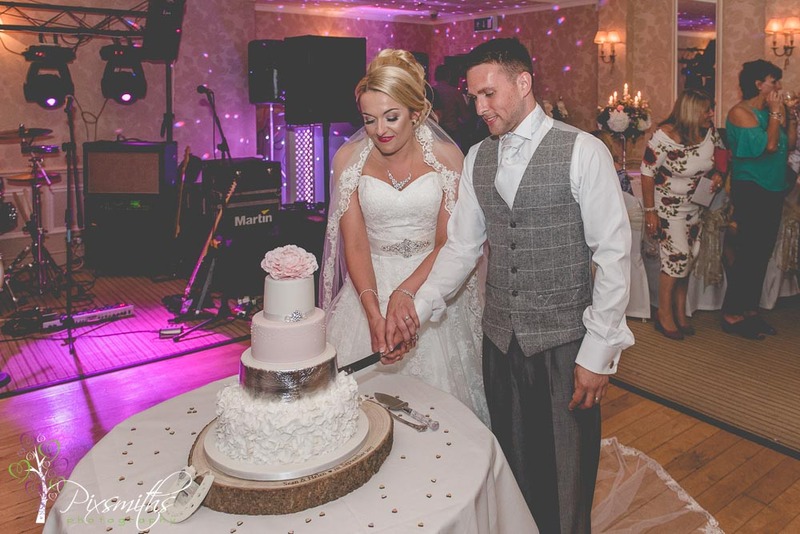 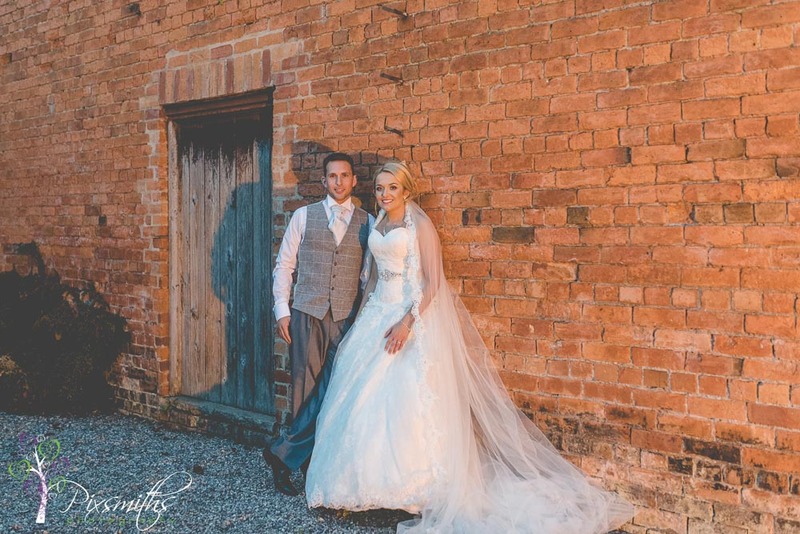 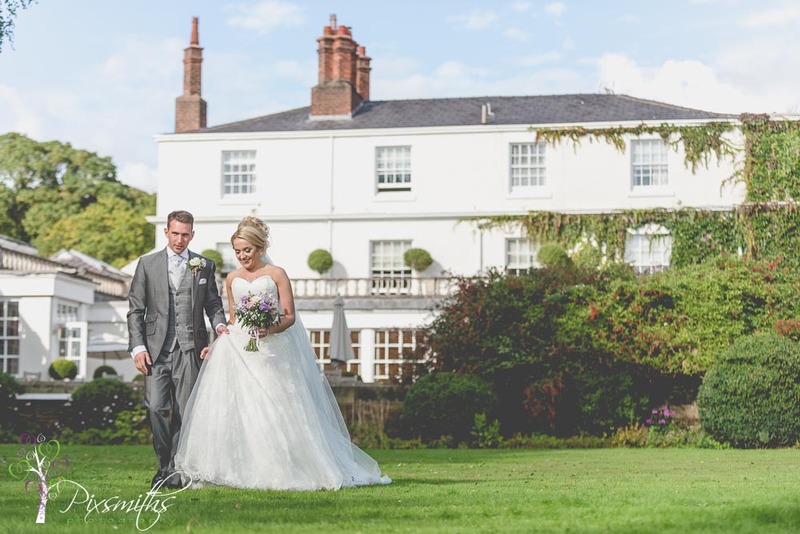 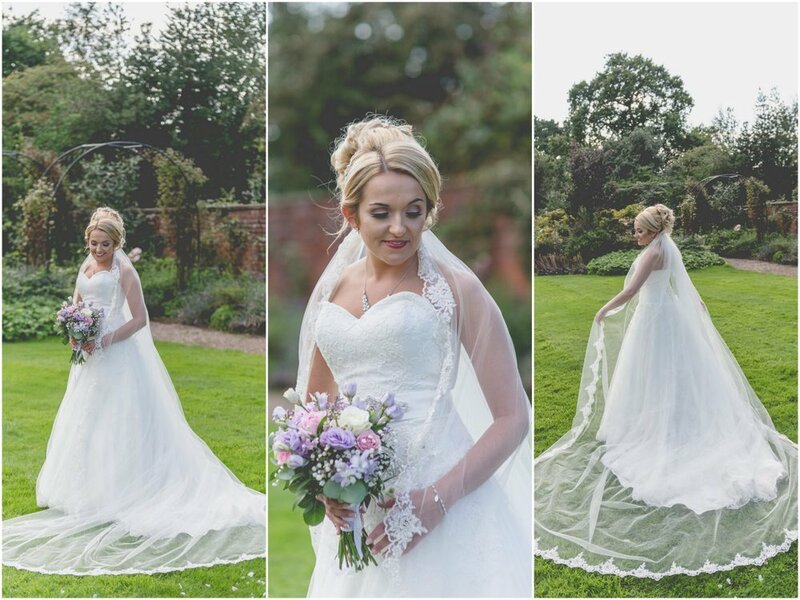 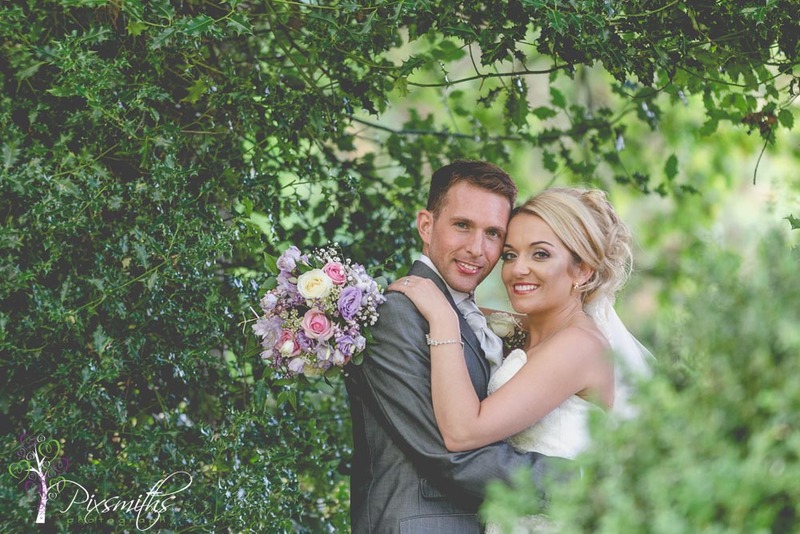 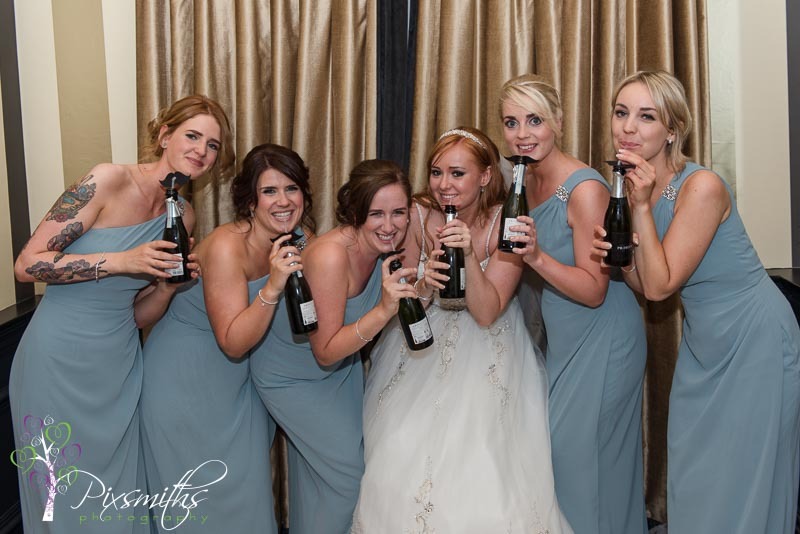 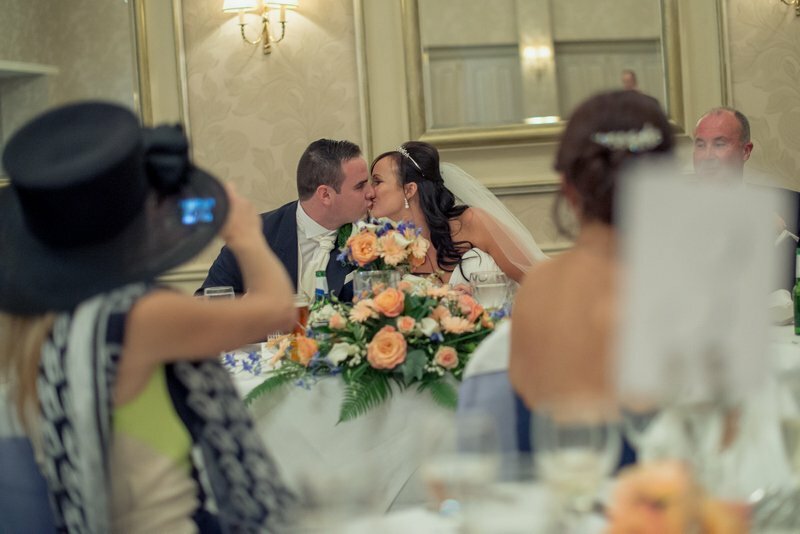 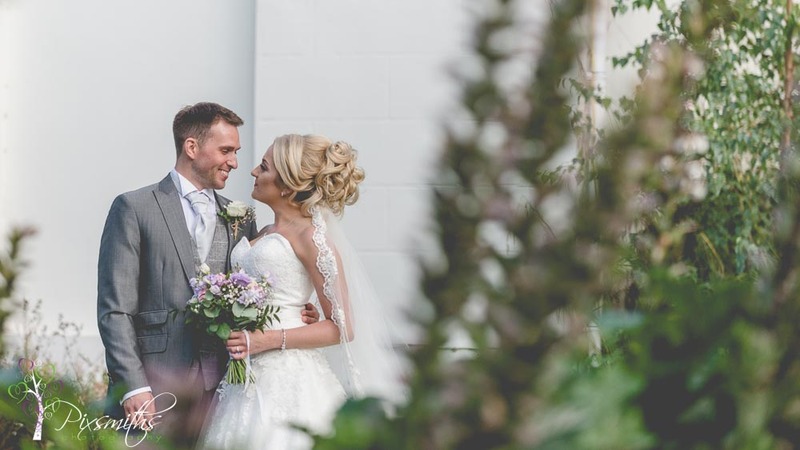 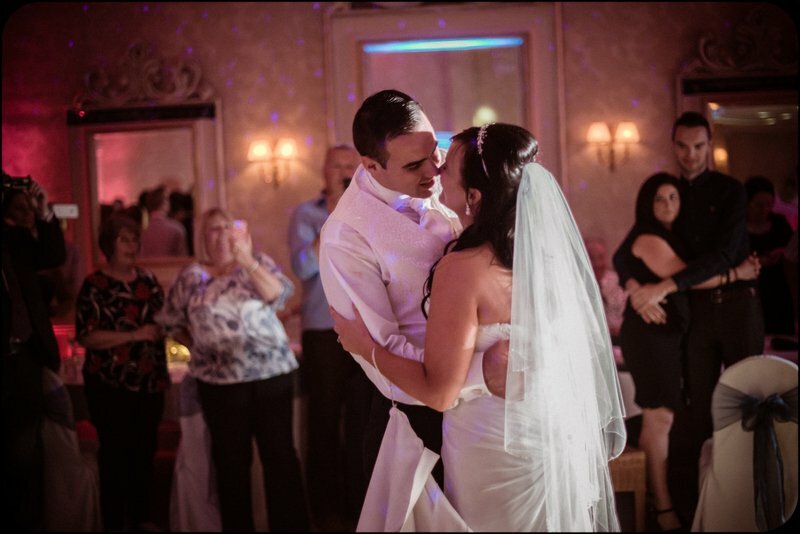 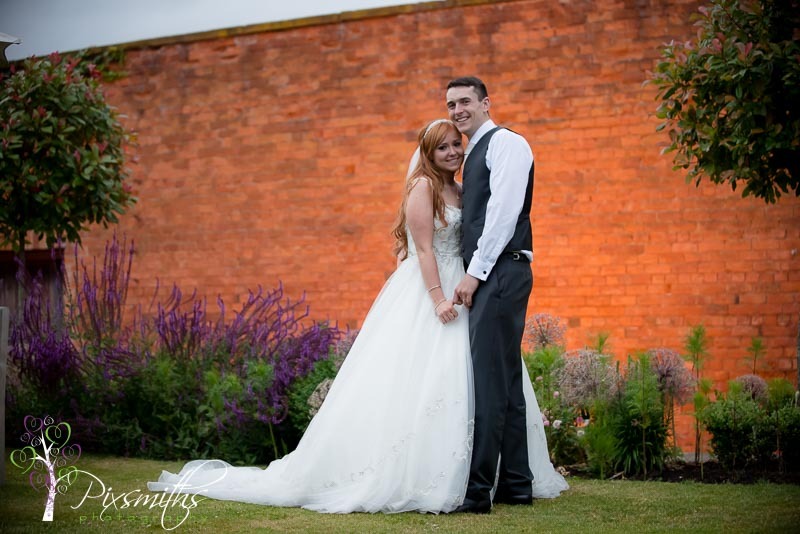 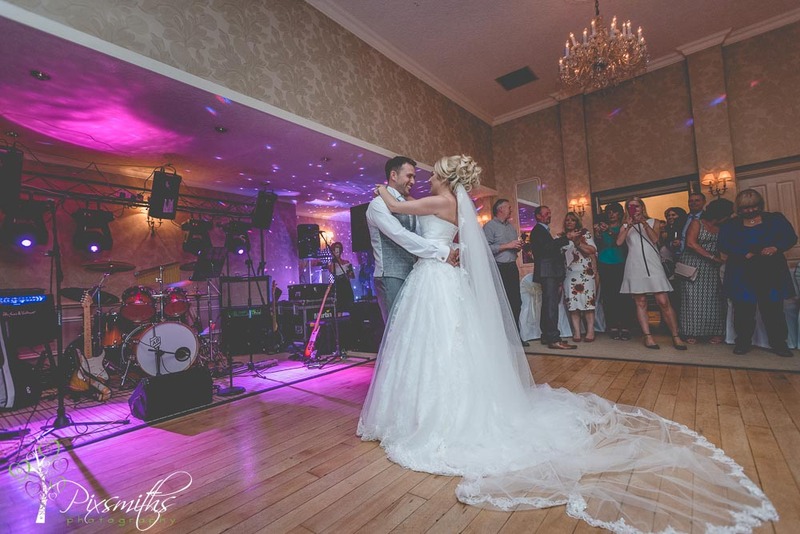 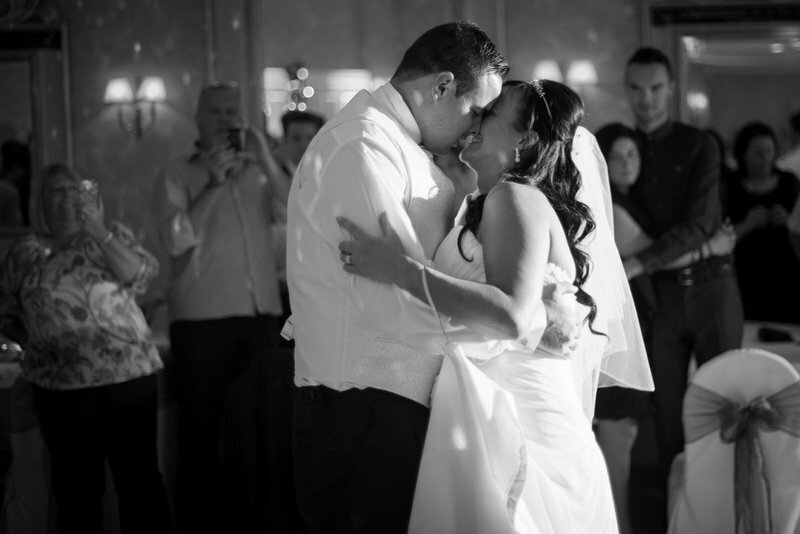 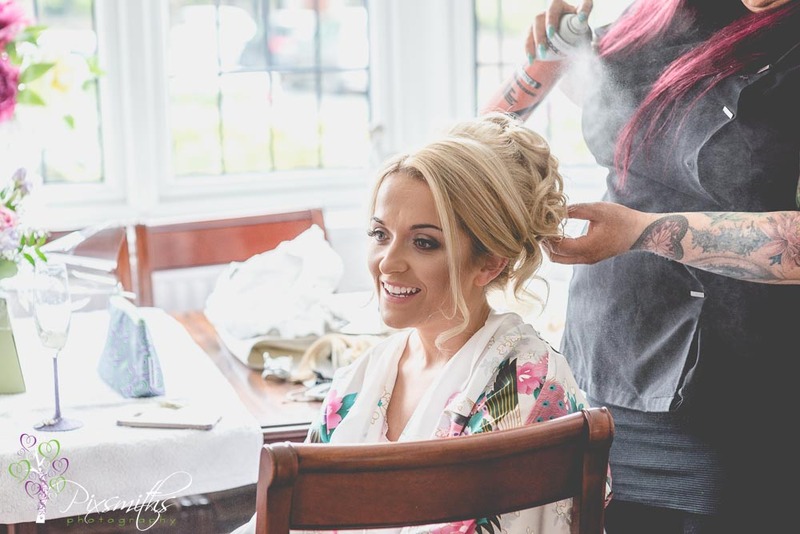 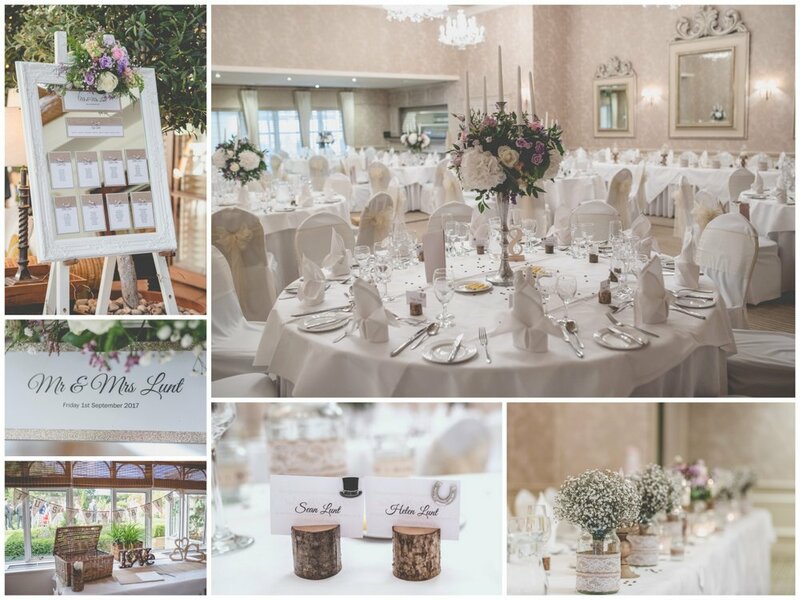 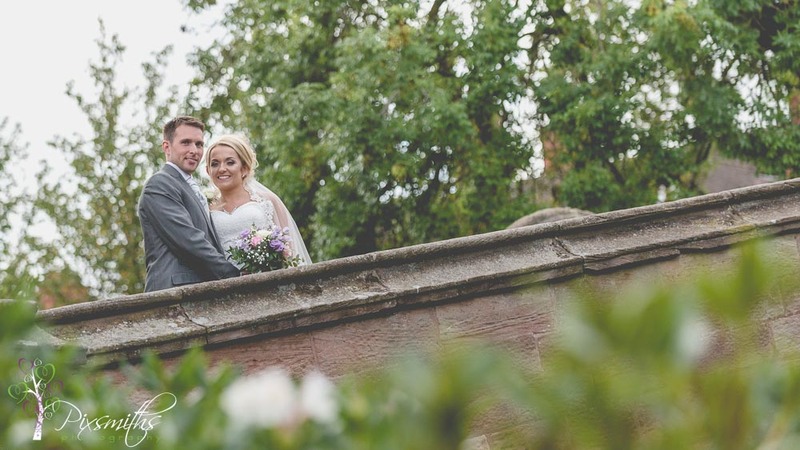 Oh Helen and Sean we absolutely loved sharing your amazing Rowton Hall wedding day! 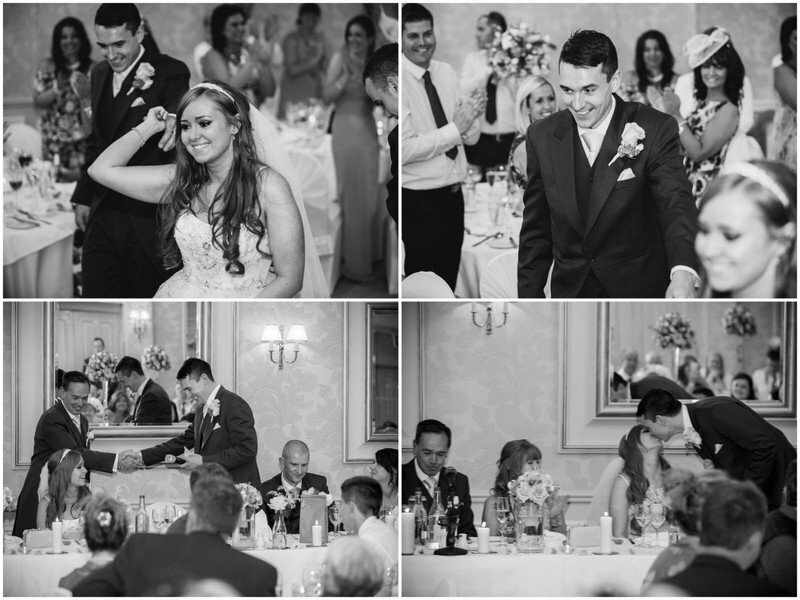 Absolute joy and privilege to capture all those moments. 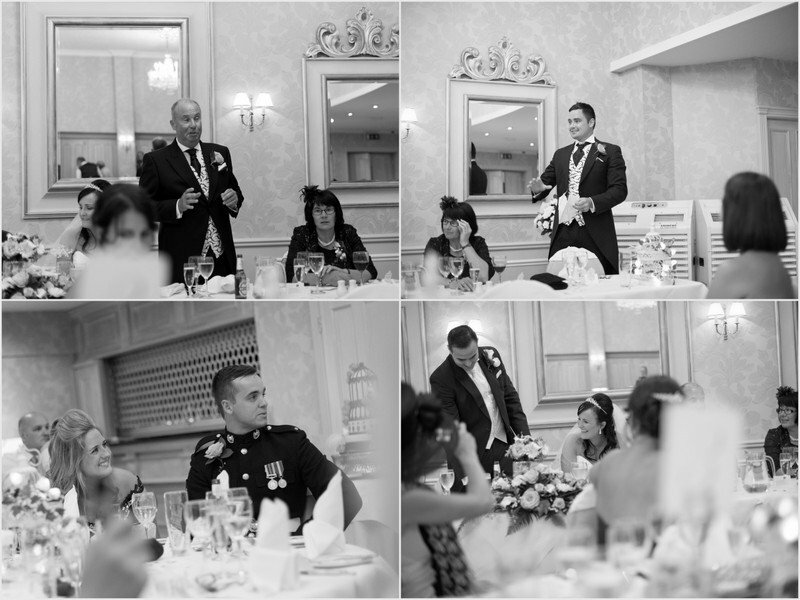 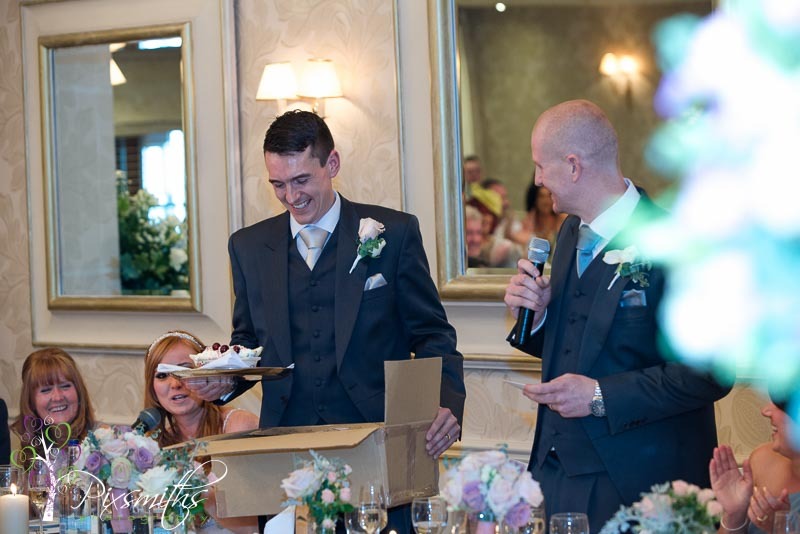 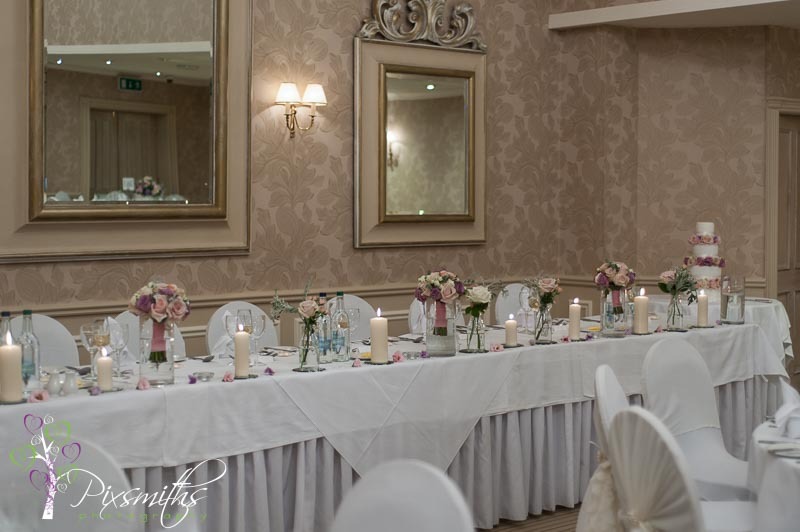 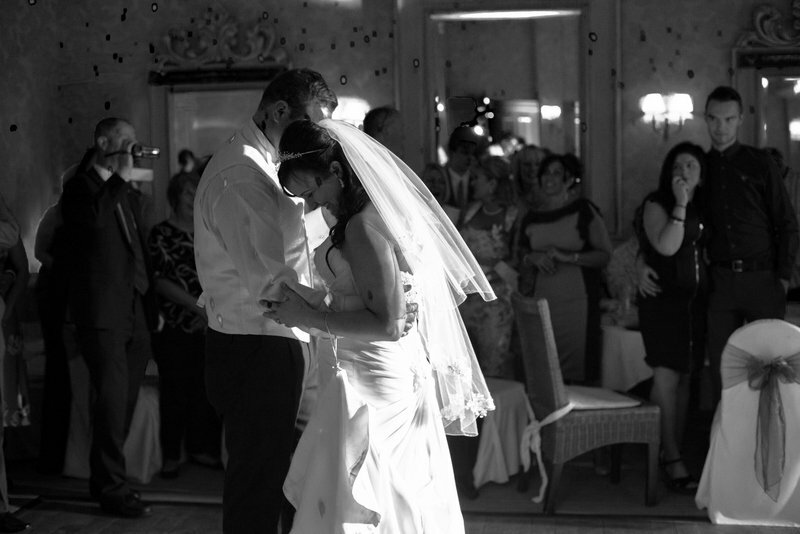 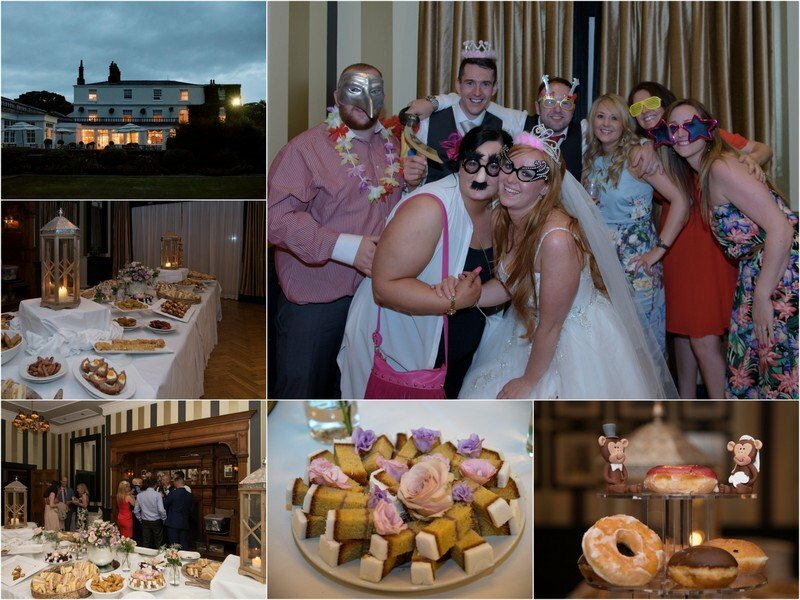 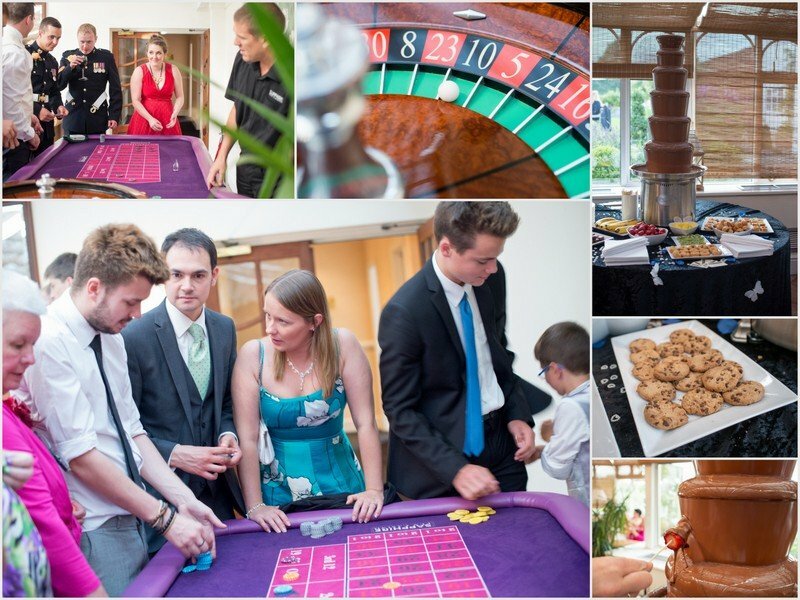 A Cheshire wedding reception out at the stunning and wonderfully organised Rowton Hall Hotel. 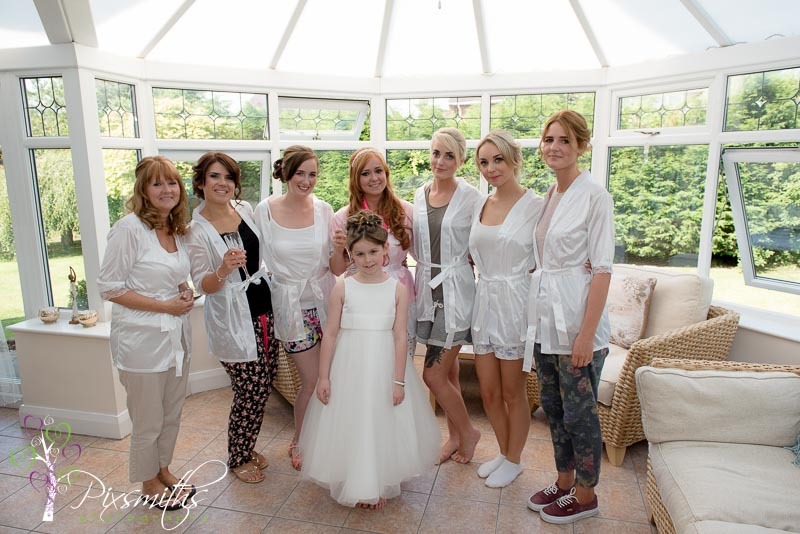 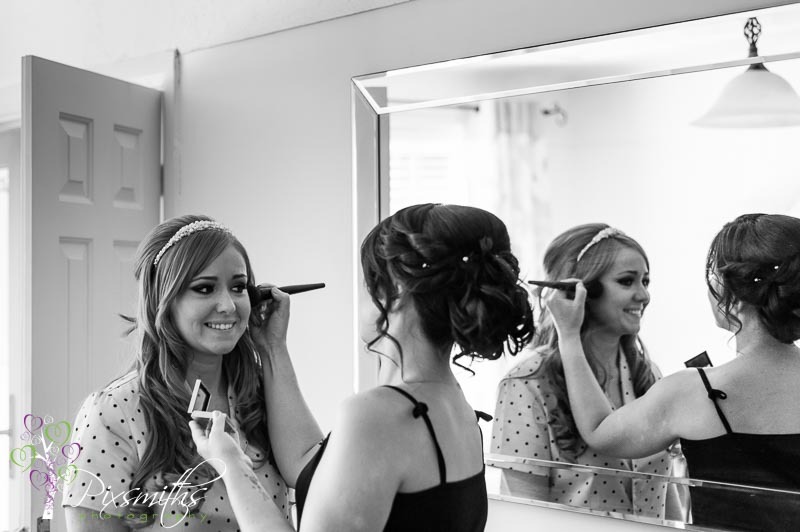 Bridal preps were very relaxed, all the girls being pampered. 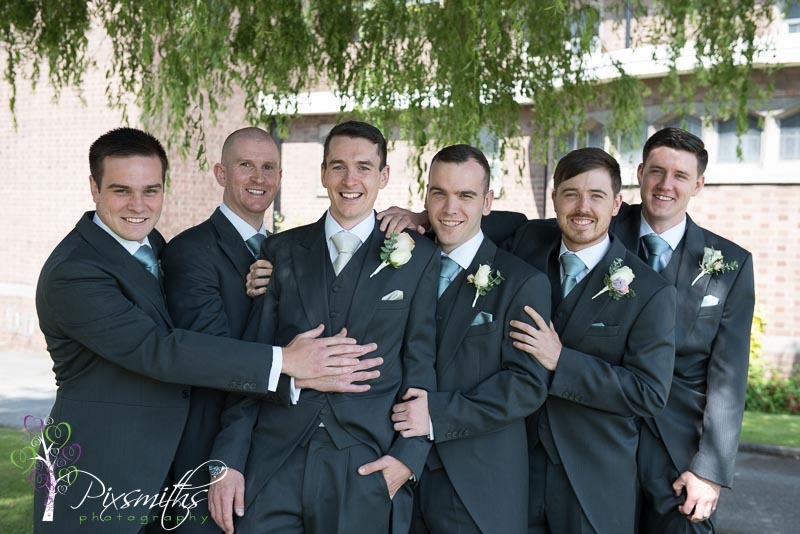 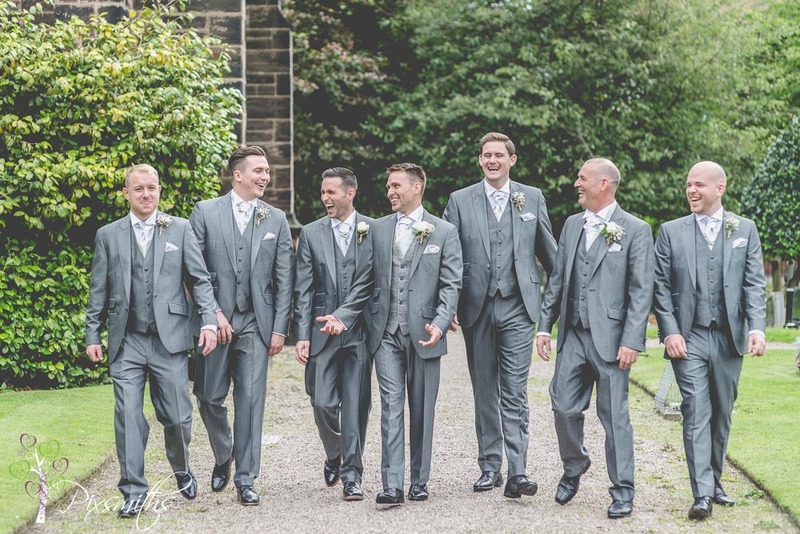 How handsome does Shaun and all his groomsmen look in their suit from Munros! 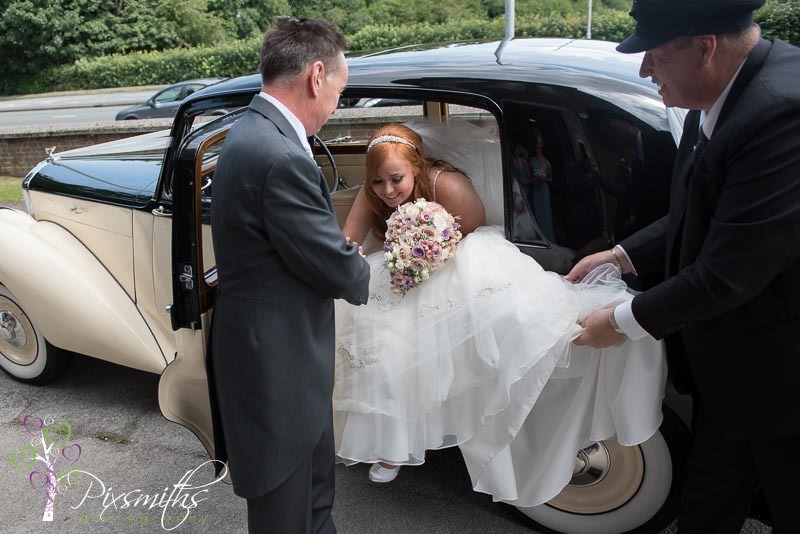 Soon it was time for Helen to arrive at Christchurch in the beautiful Bentley of Classic Bridal Cars, with the Bridesmaids eagerly awaiting at the lych gate. 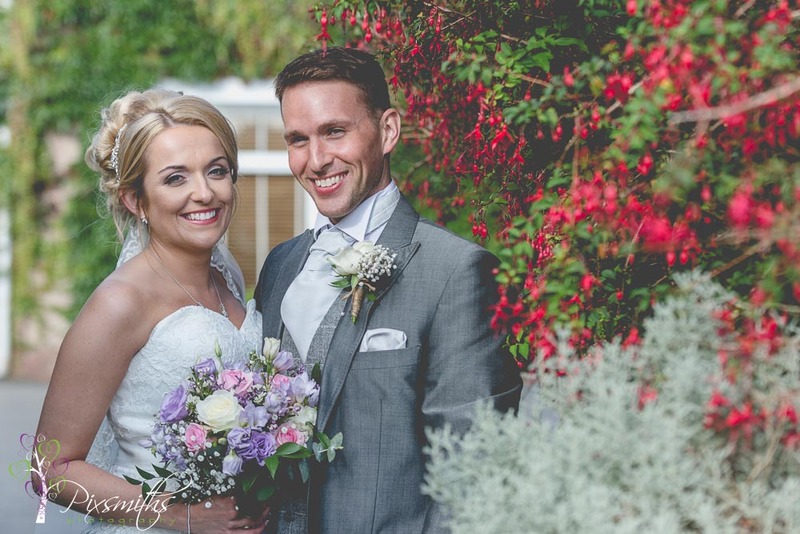 The gardeners had been doing an amazing job right up to he ceremony and gardens looked immaculate and colourful and the sun was shining! 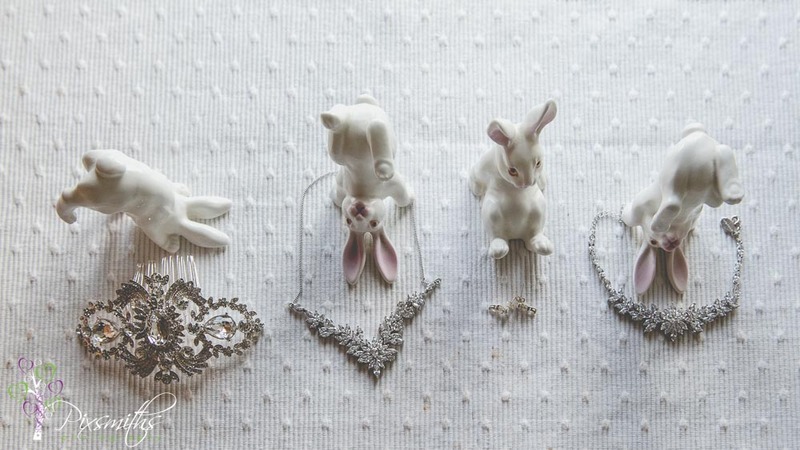 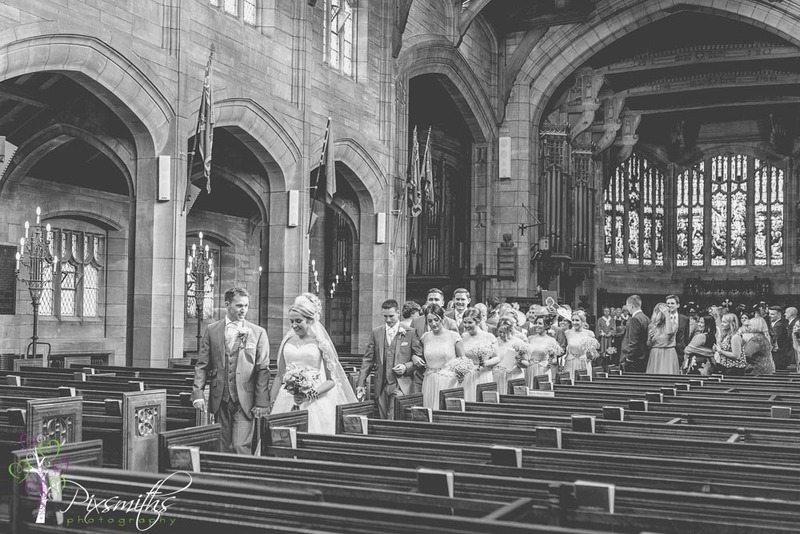 A walk down that long long aisle to her waiting groom. 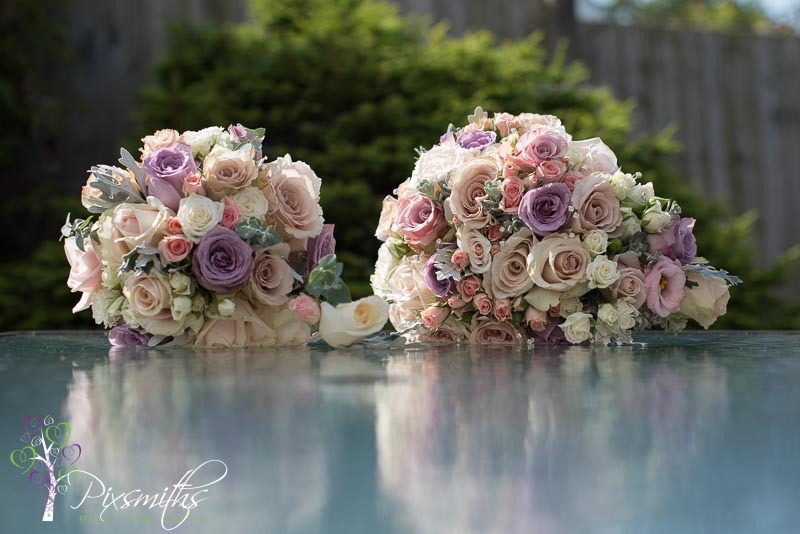 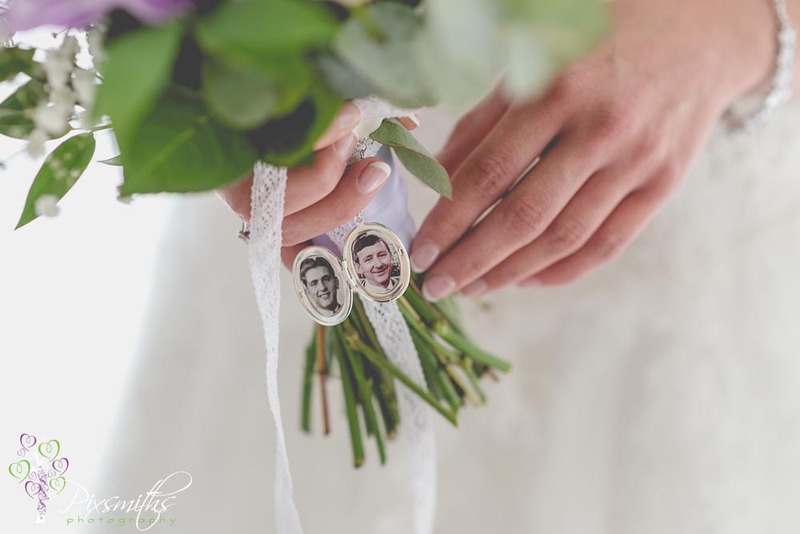 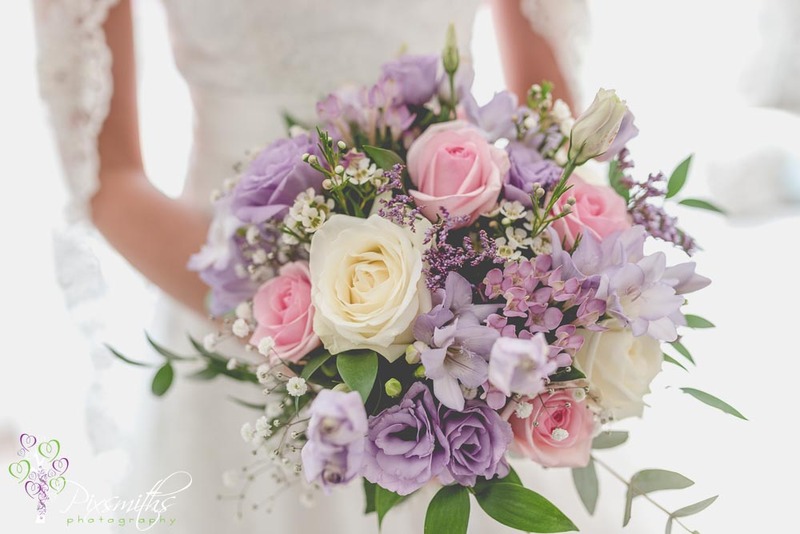 carrying her granddads images with her in her beautiful bridal bouquet from Angela Adlard. 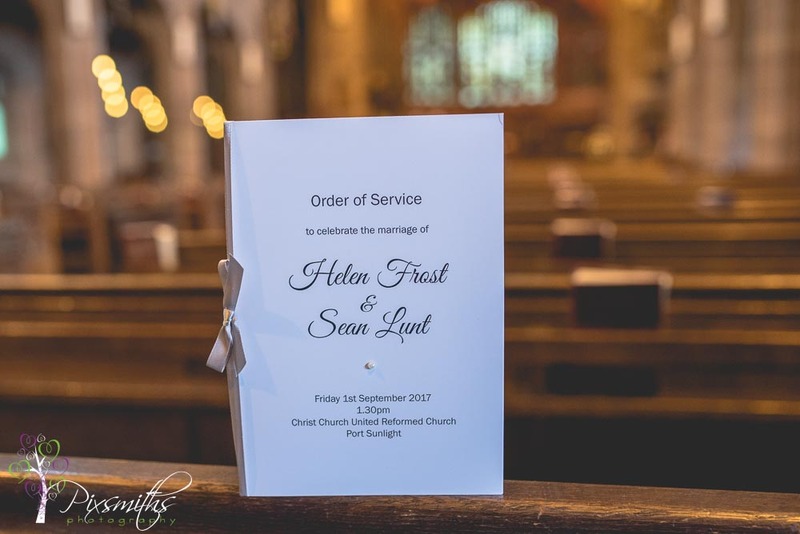 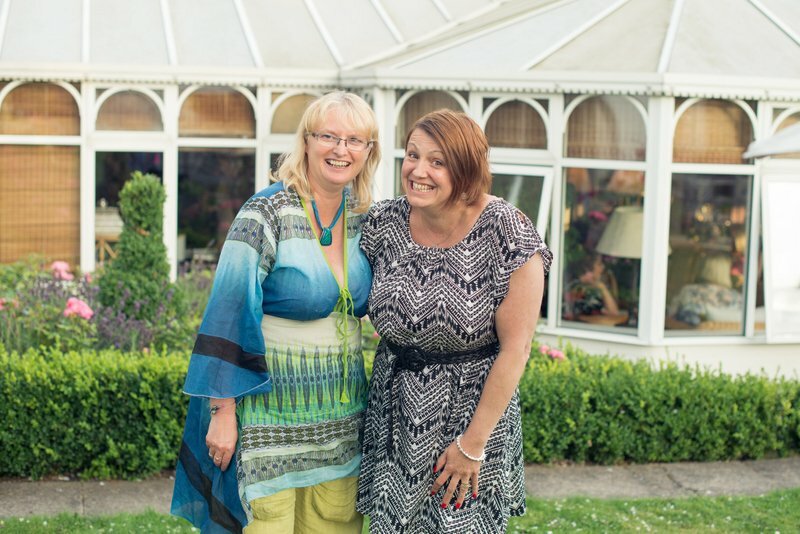 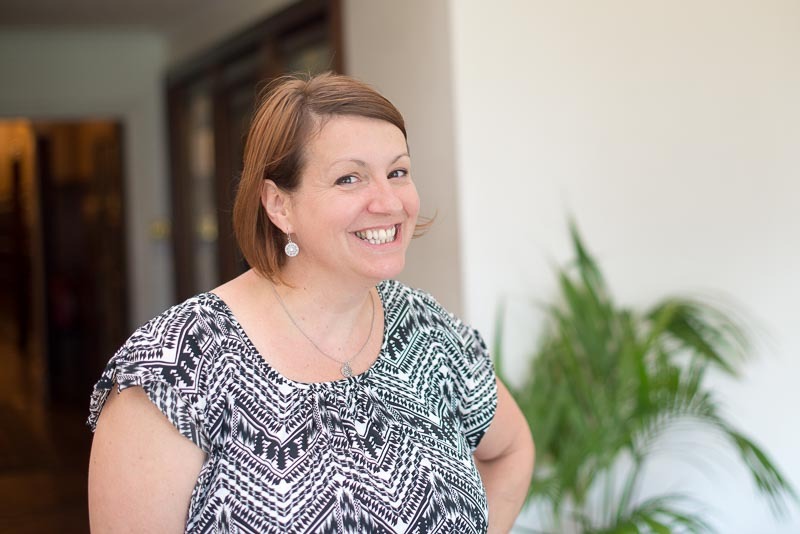 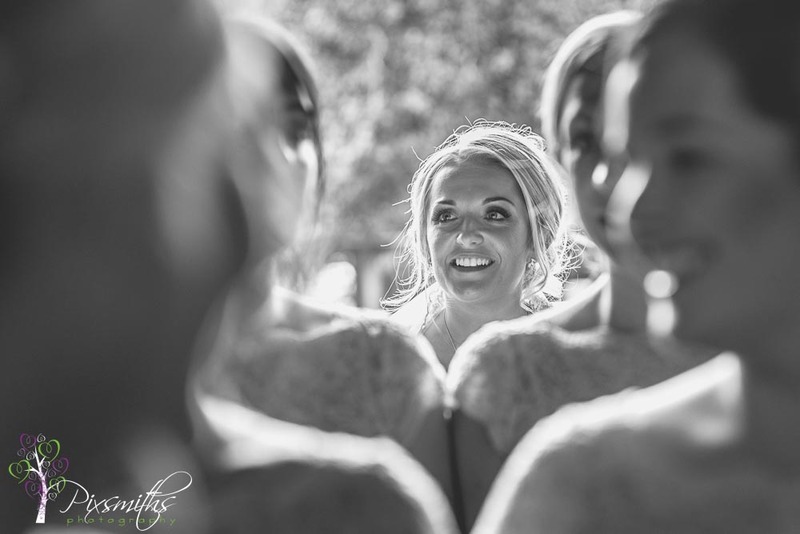 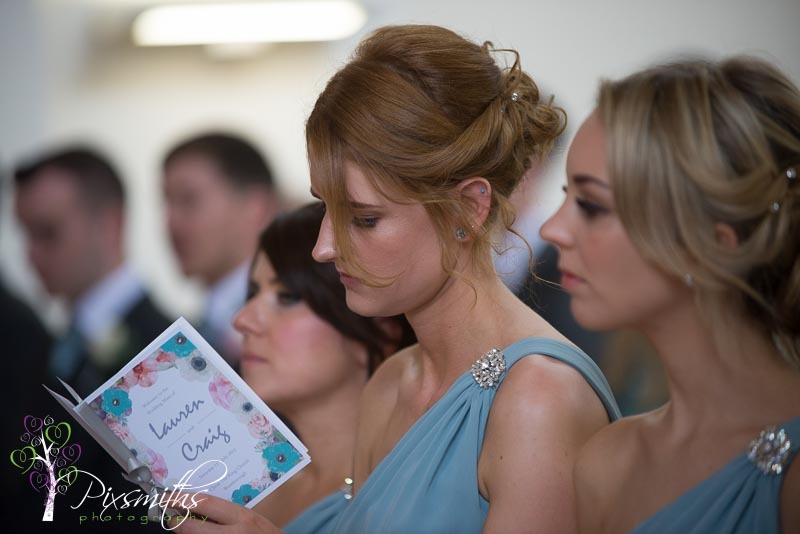 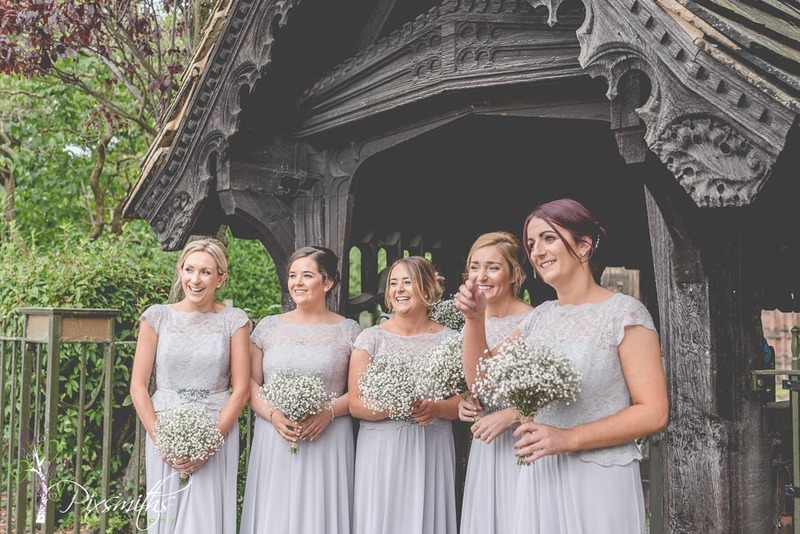 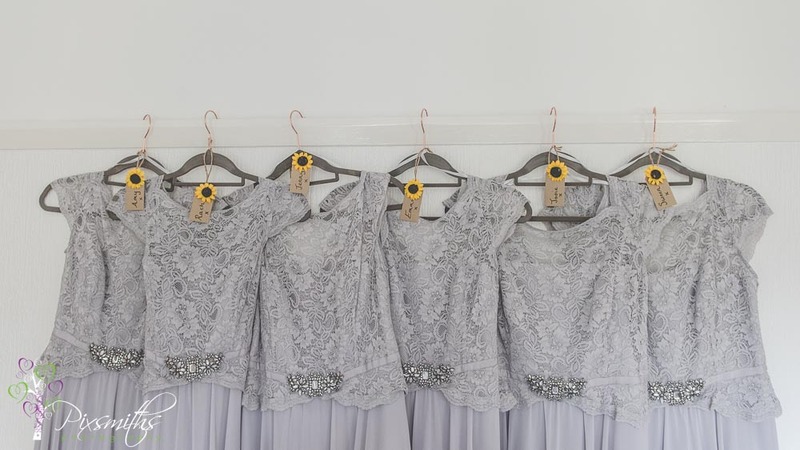 Helen’s best friend and Matron of Honour was THE most attentive bridesmaid, the bond of long friendship between them was so evident, cue that image of emotions as Helen entered the church. 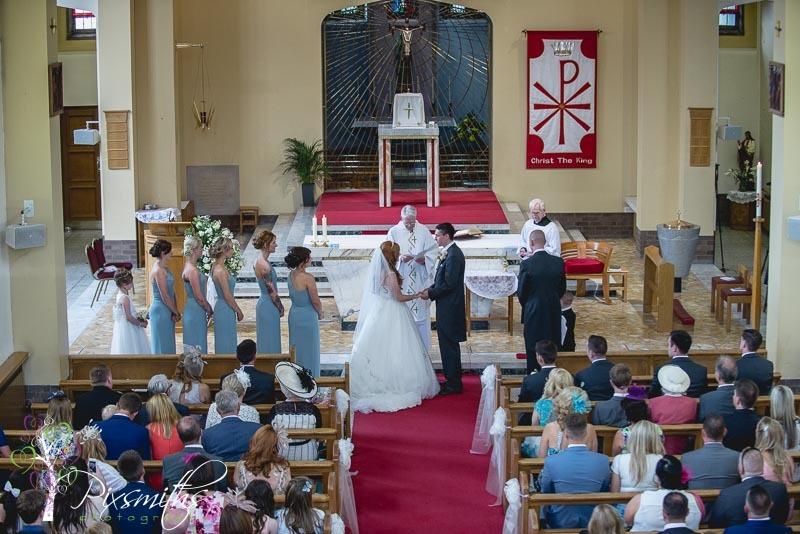 Hymns sung and vows exchanged, beautiful ceremony and great to be able to capture photography from front and back of this gorgeous church now. 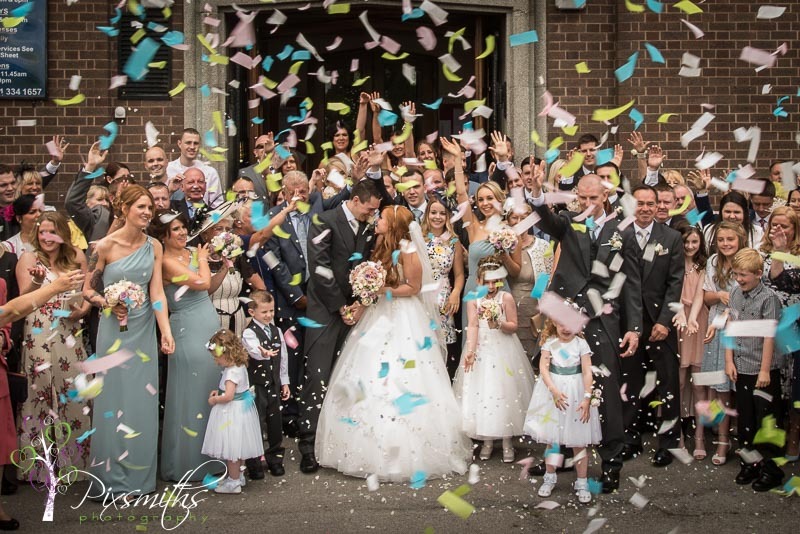 Soon out to the bright sunshine, few formal groups and then a confetti exit. 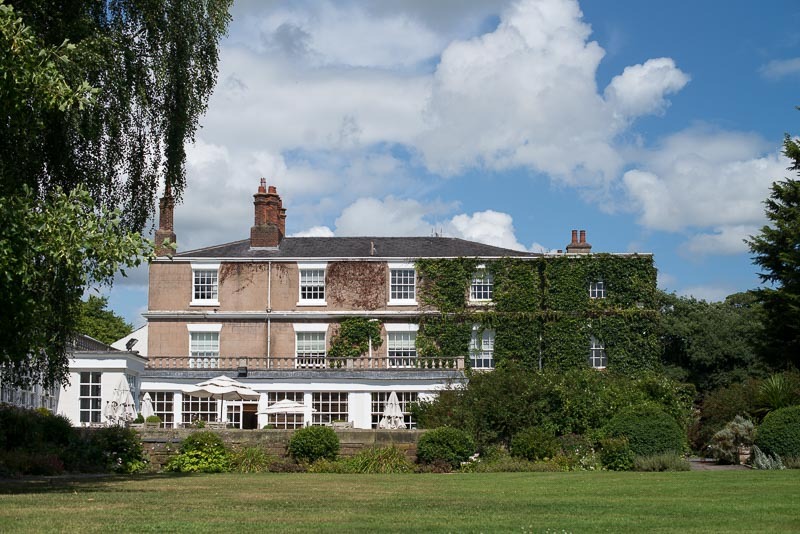 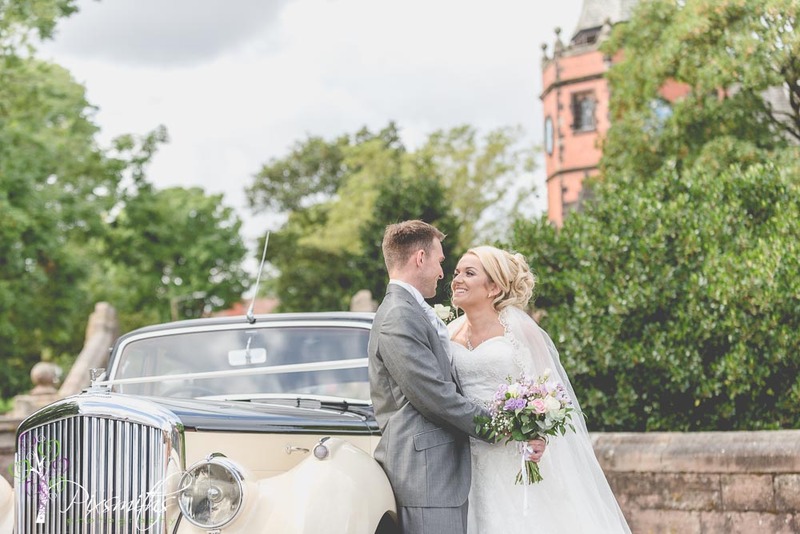 Onto to Rowton hall – bit of a journey with the road works but time for the new Mr And Mrs to enjoy some alone in their luxury classic car and sipping champagne. 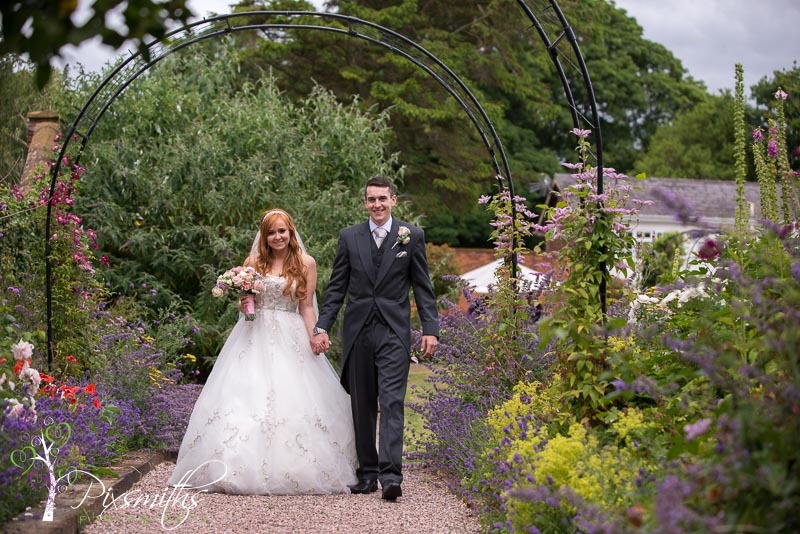 A stroll around the beautiful gardens and then soon time for the wedding breakfast and entertaining speeches. 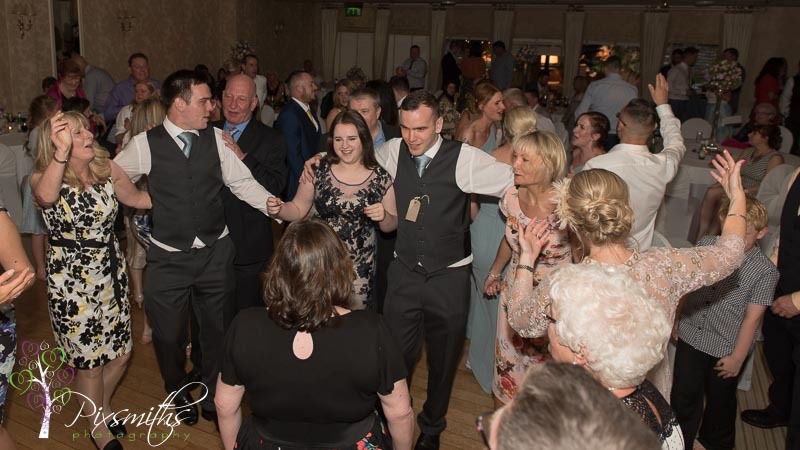 Evening soon came around and then it was party-time on the dance floor with the band Eden rocking the house. 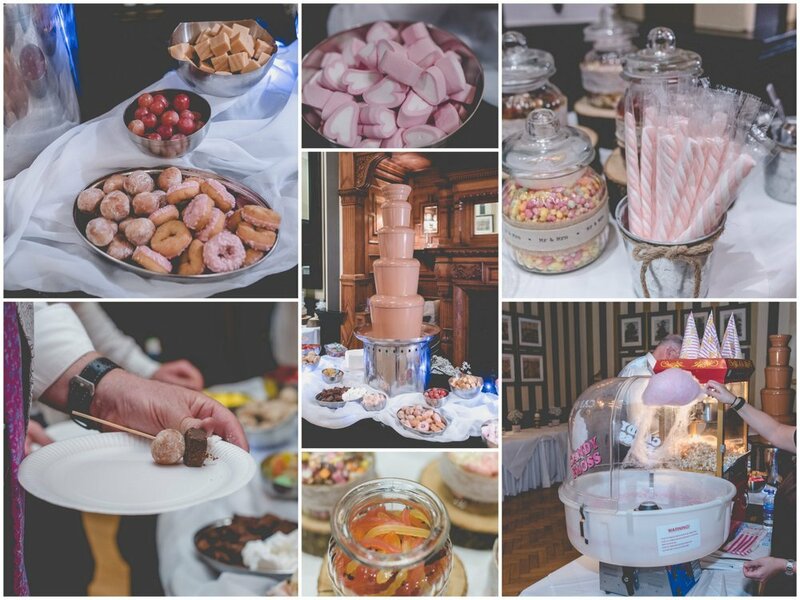 Oh and lots of fun with chocolate fountain popcorn and candyfloss! 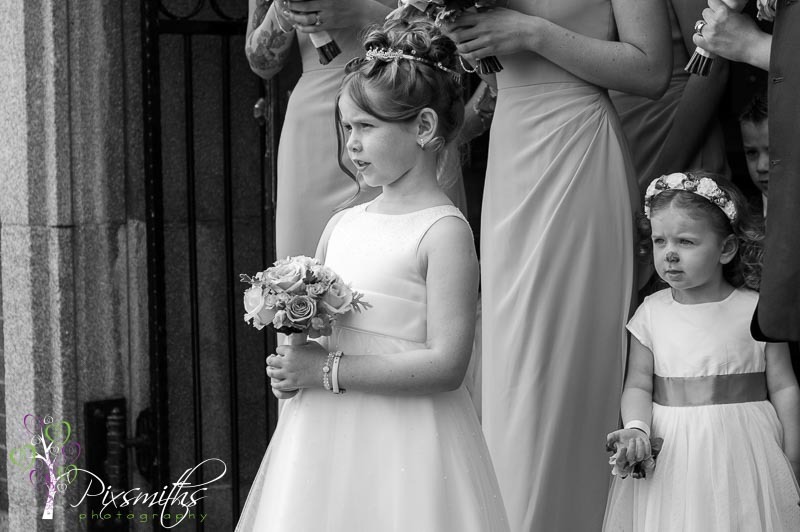 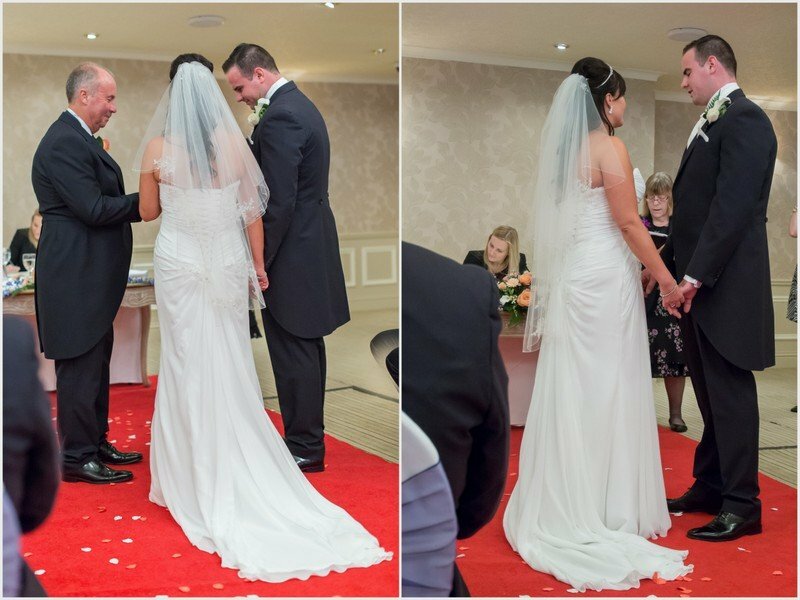 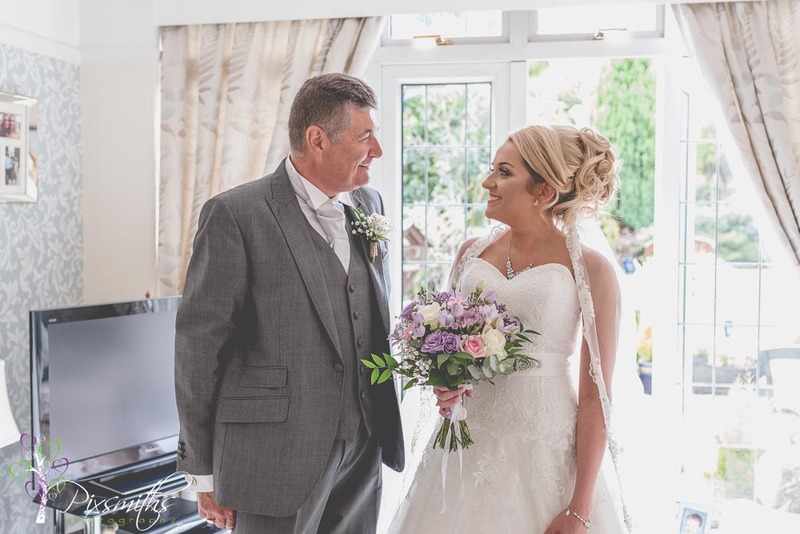 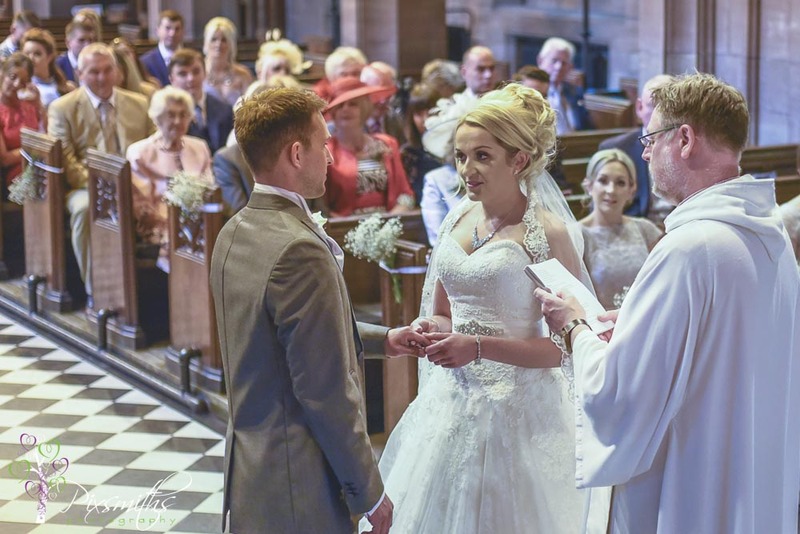 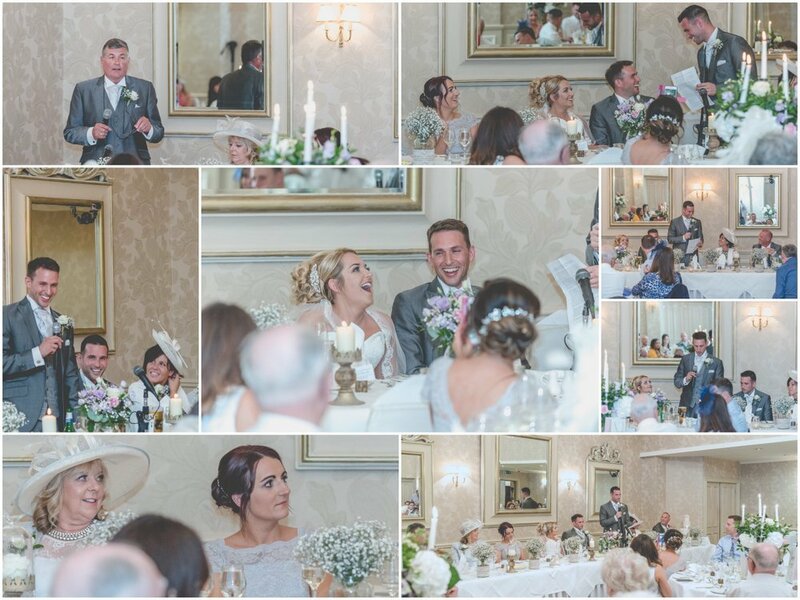 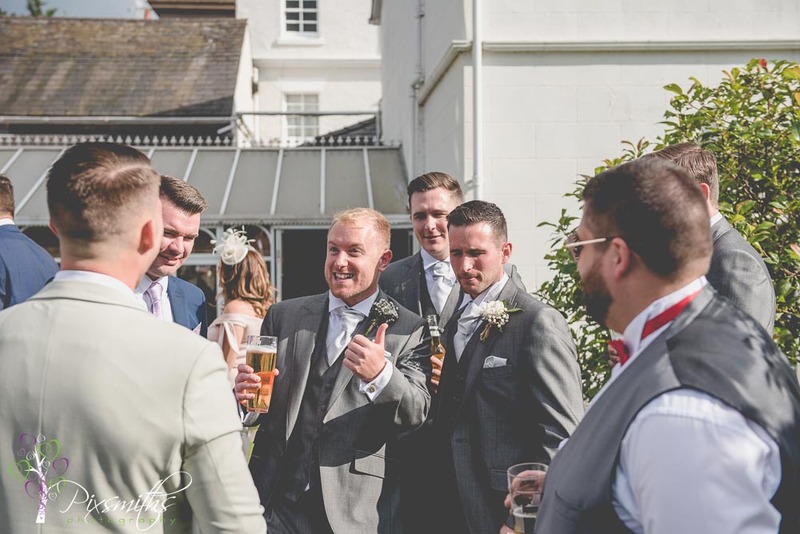 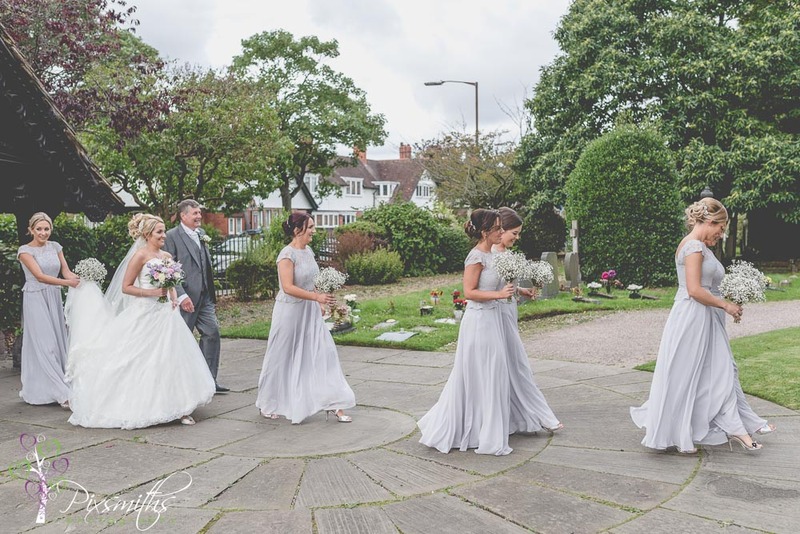 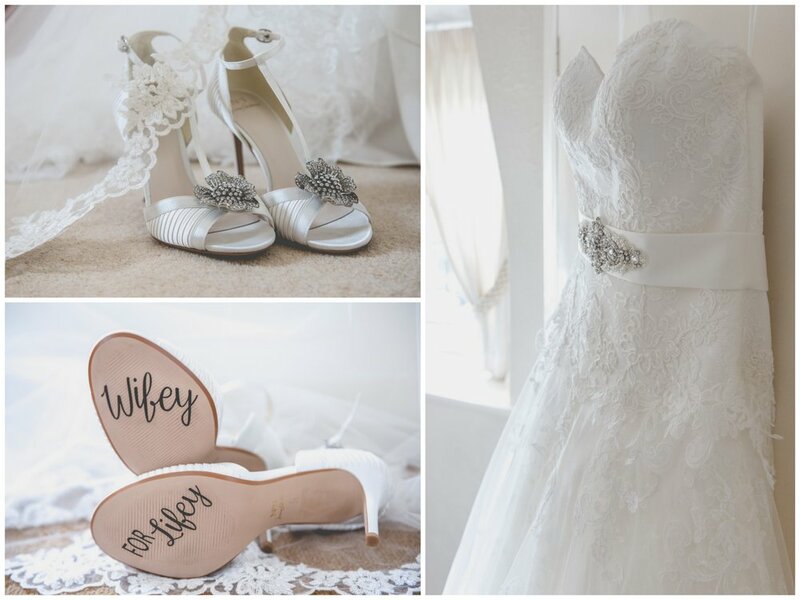 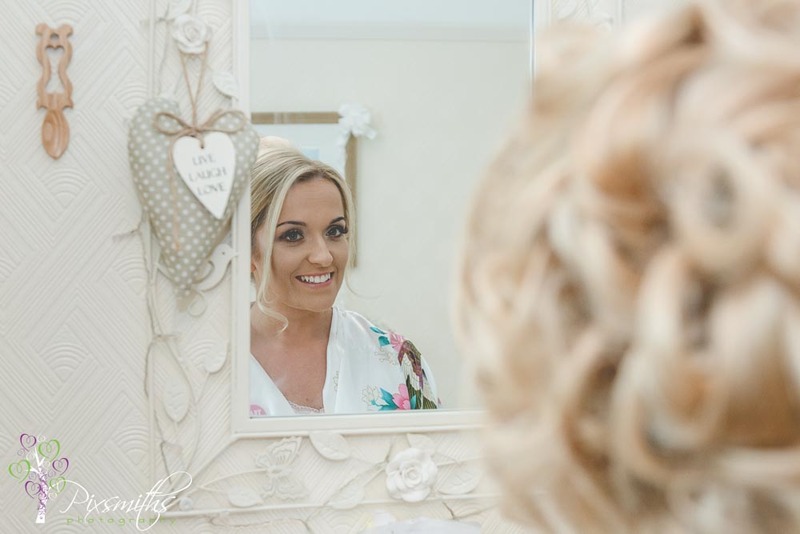 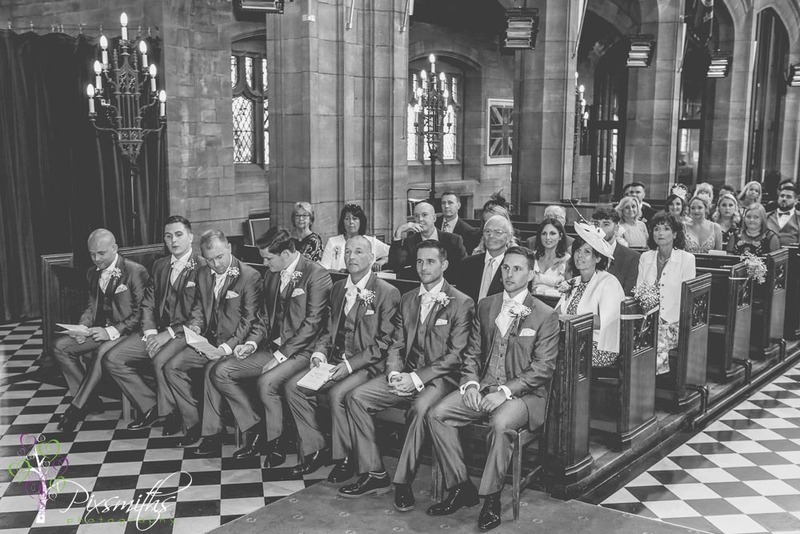 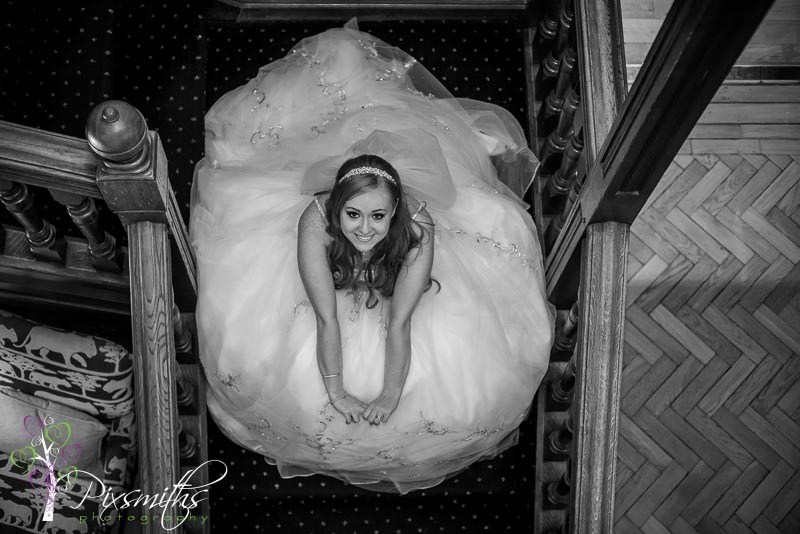 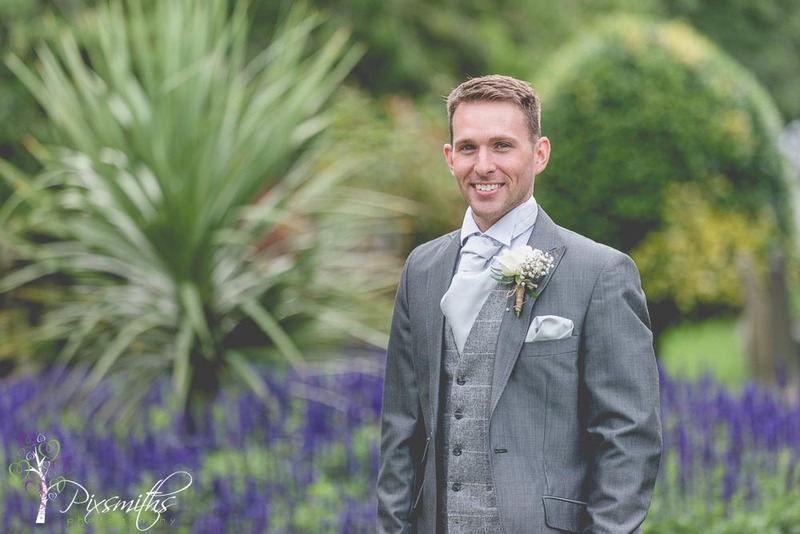 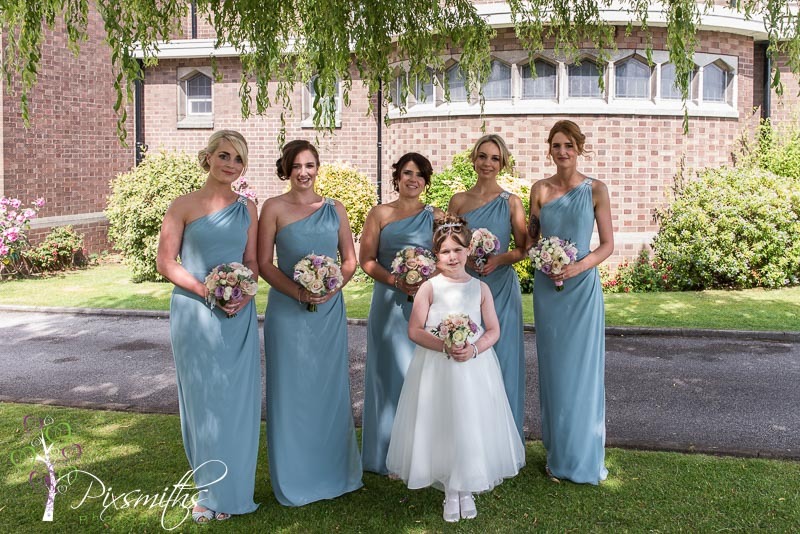 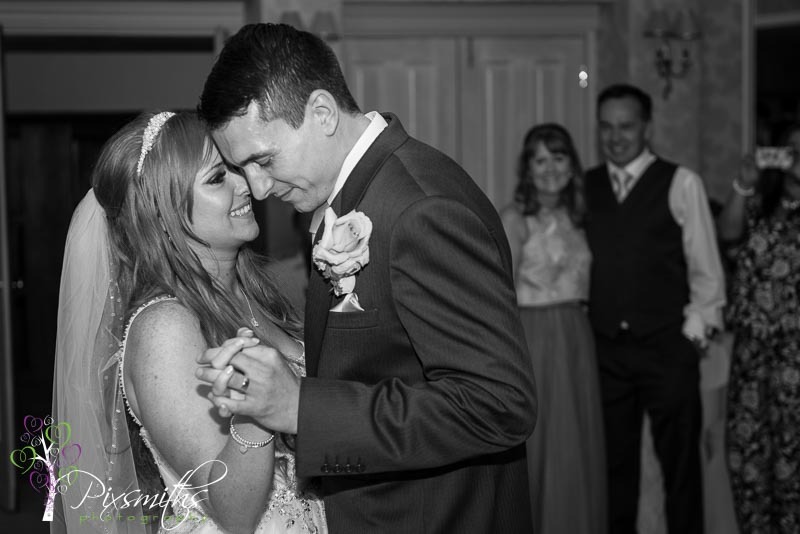 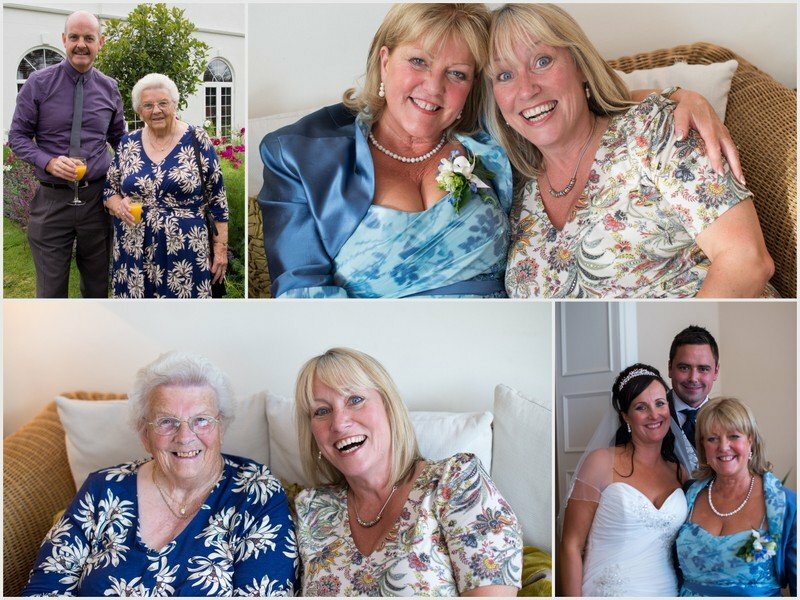 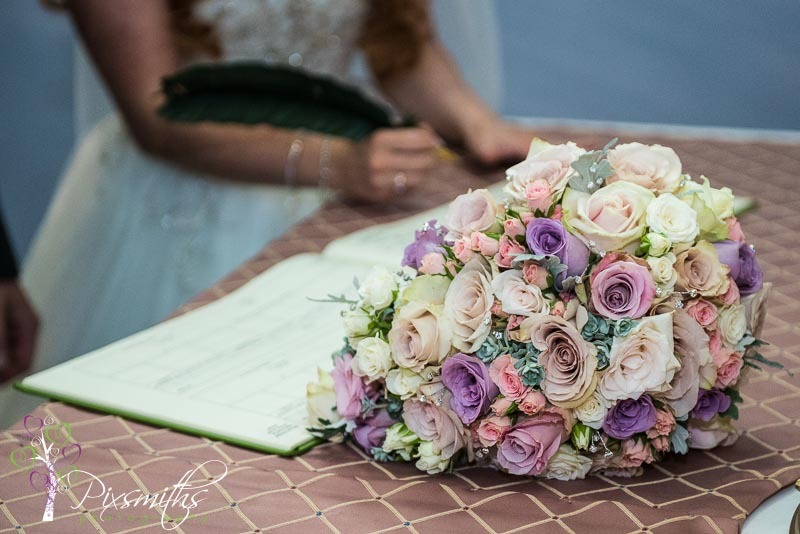 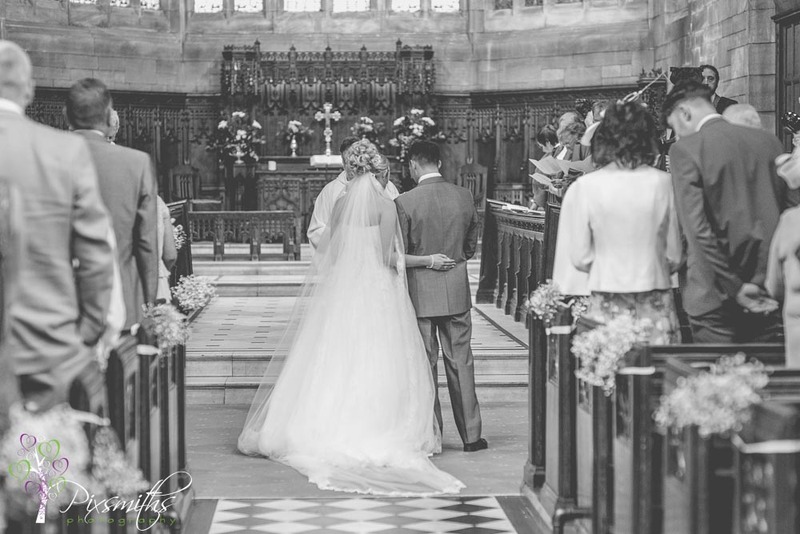 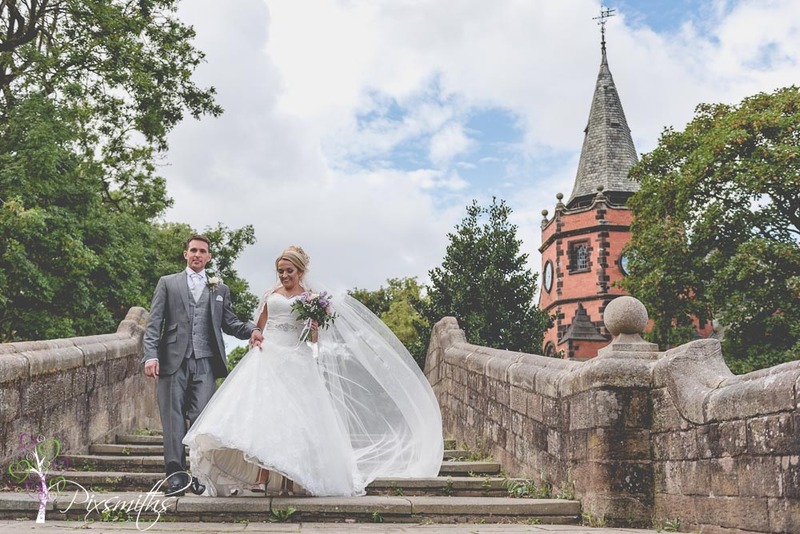 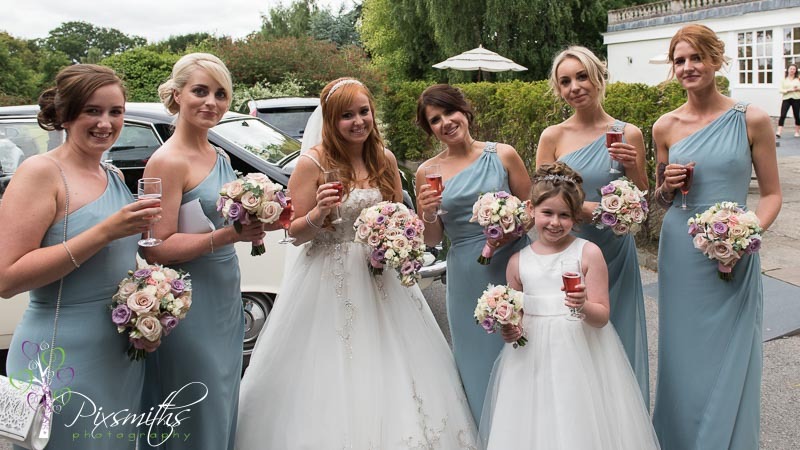 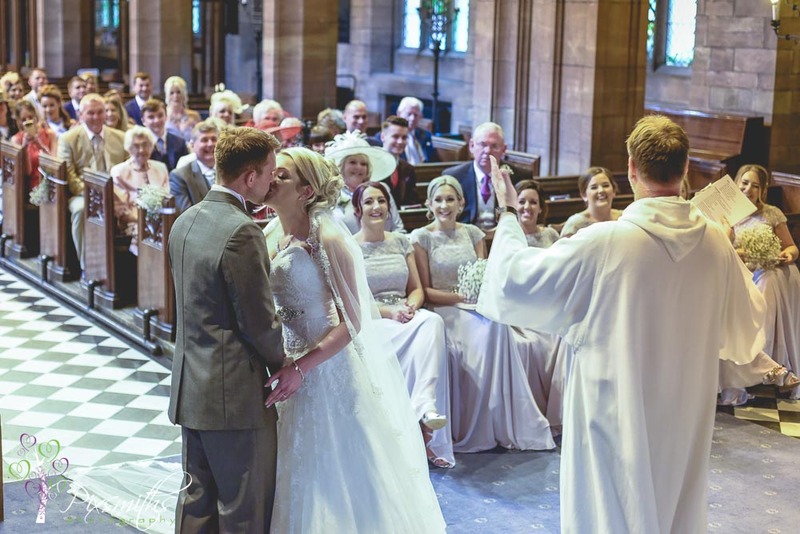 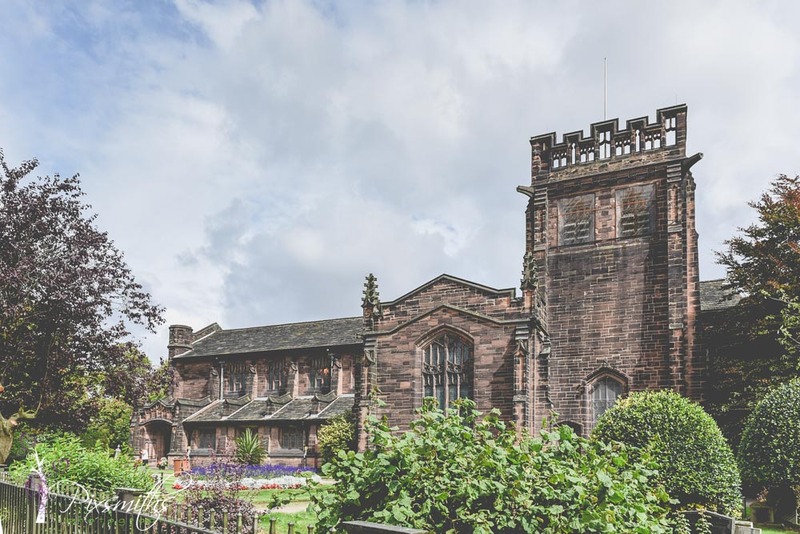 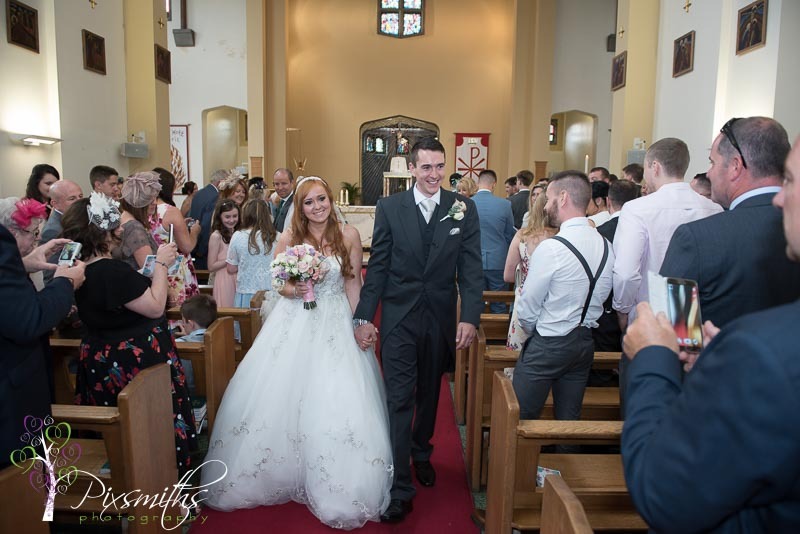 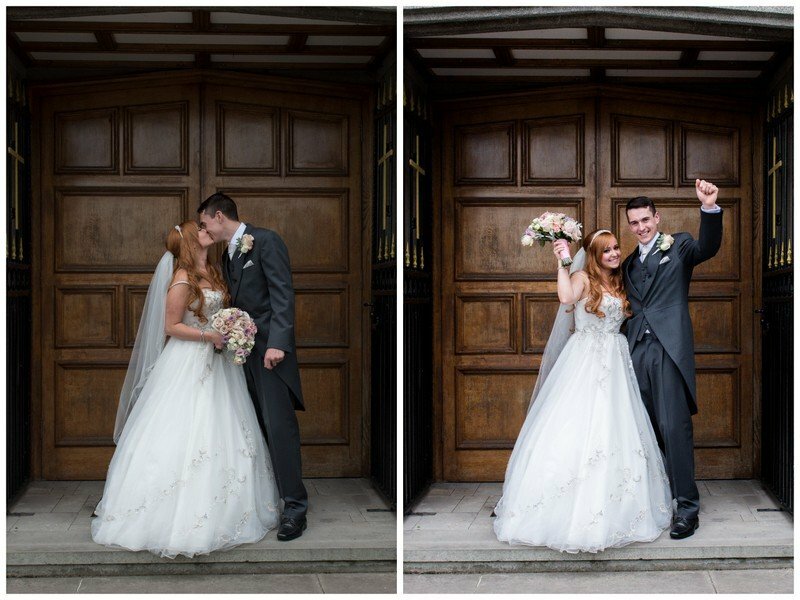 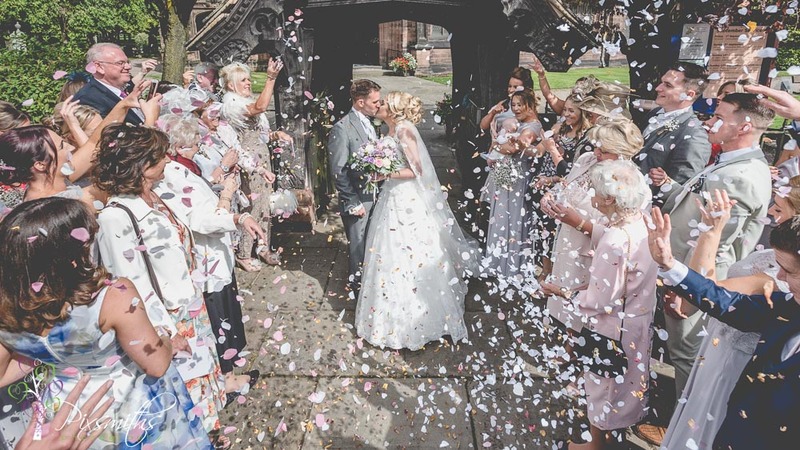 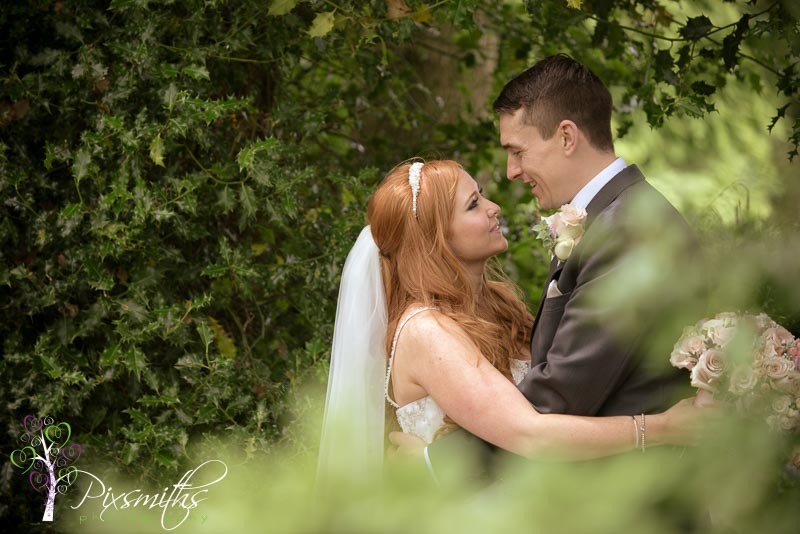 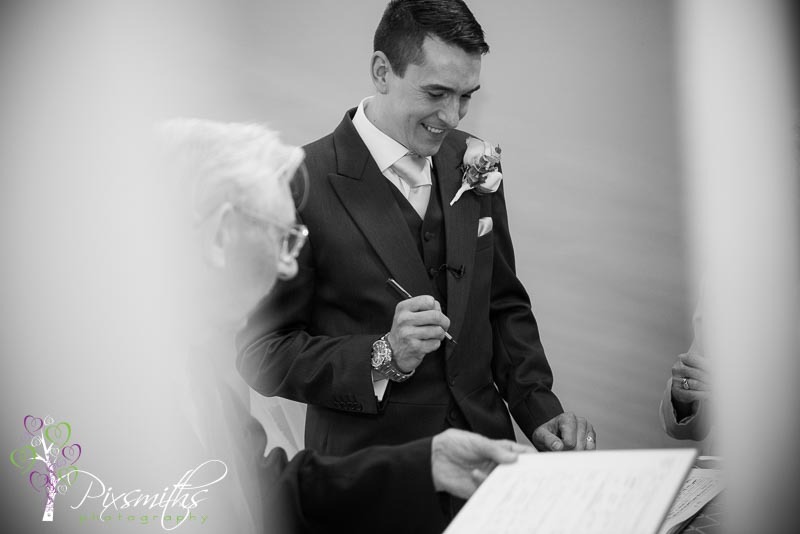 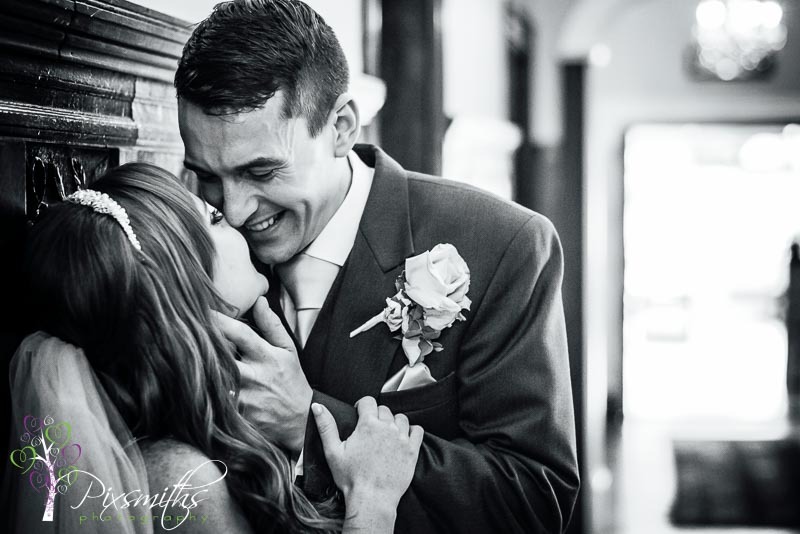 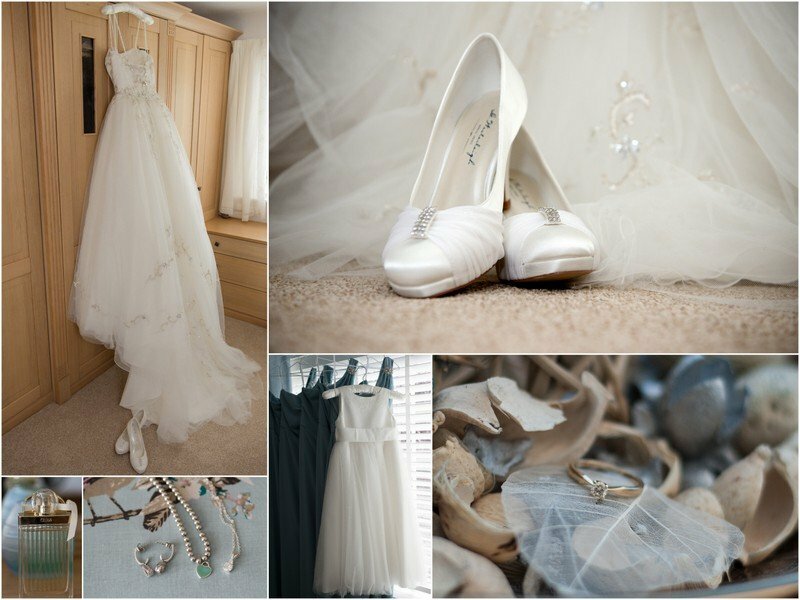 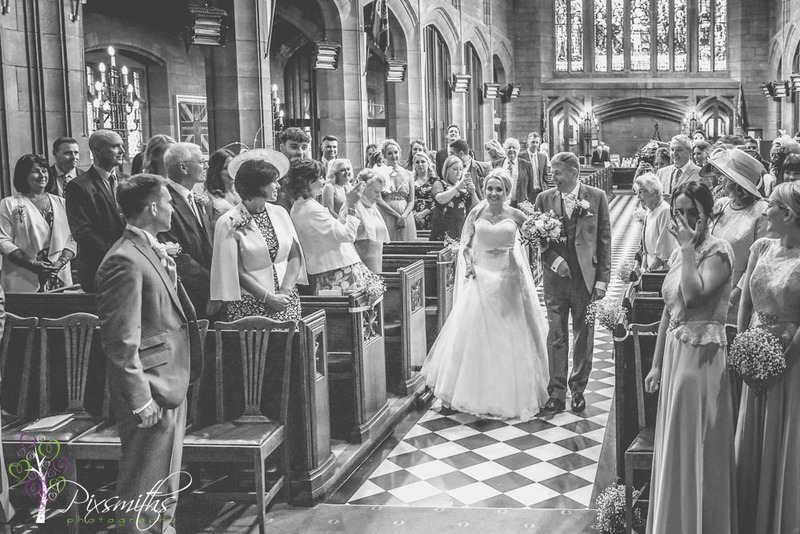 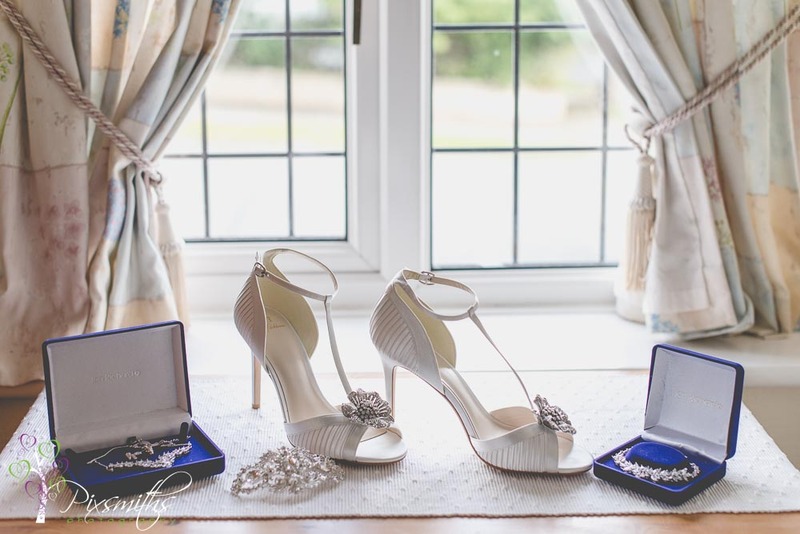 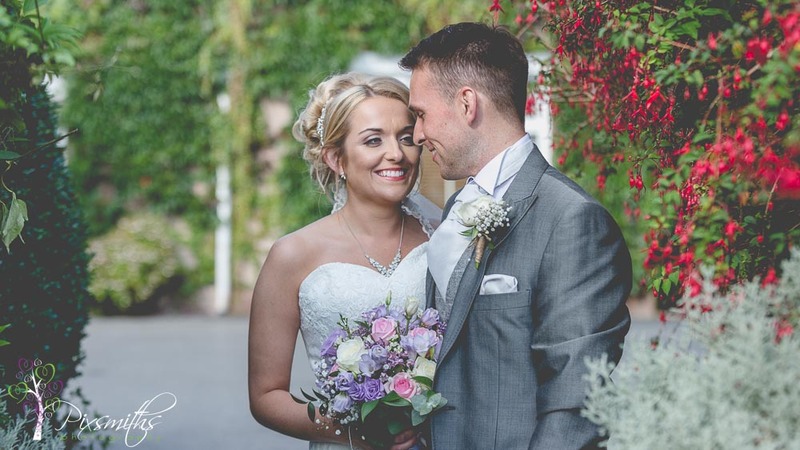 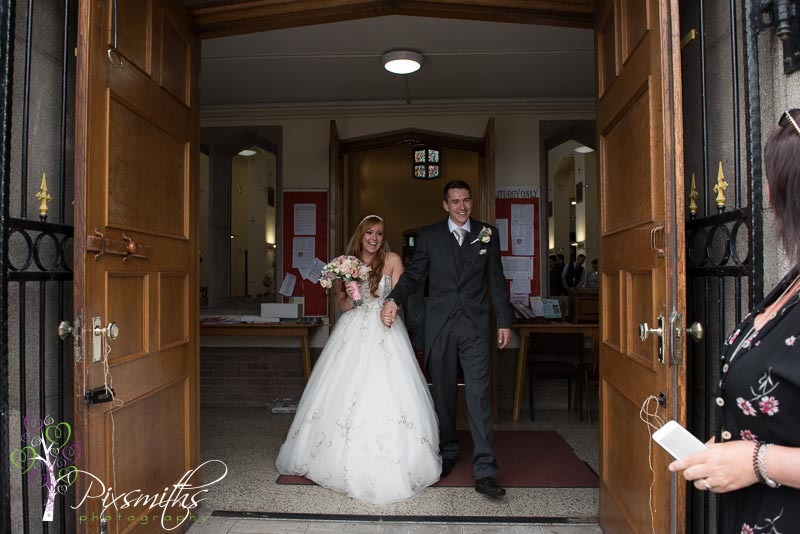 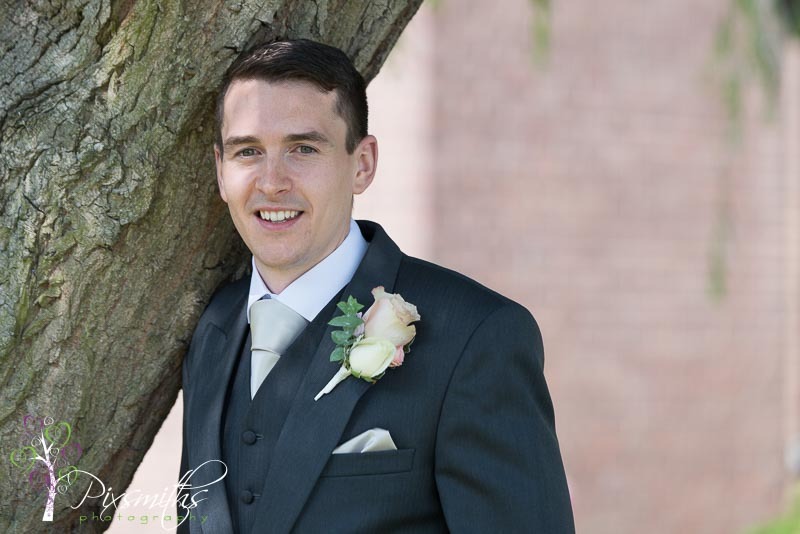 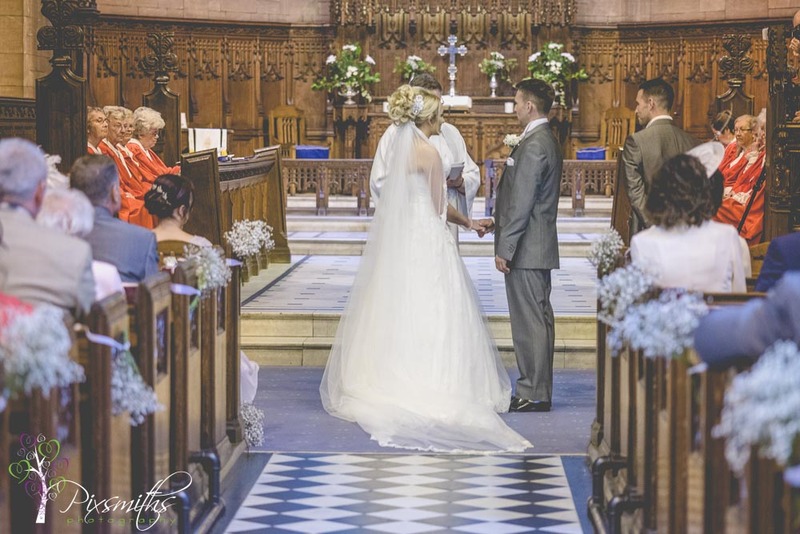 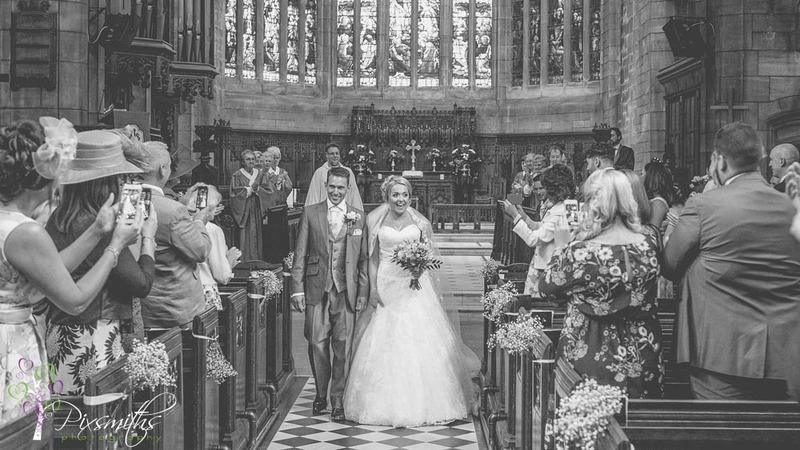 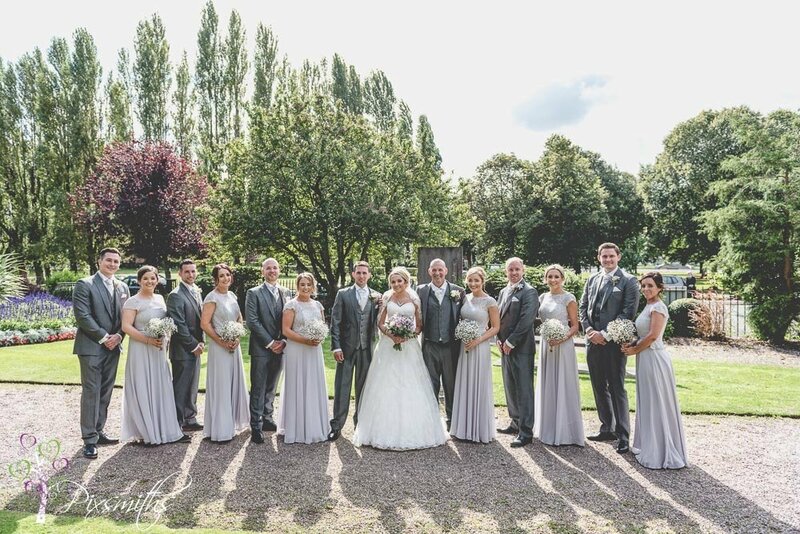 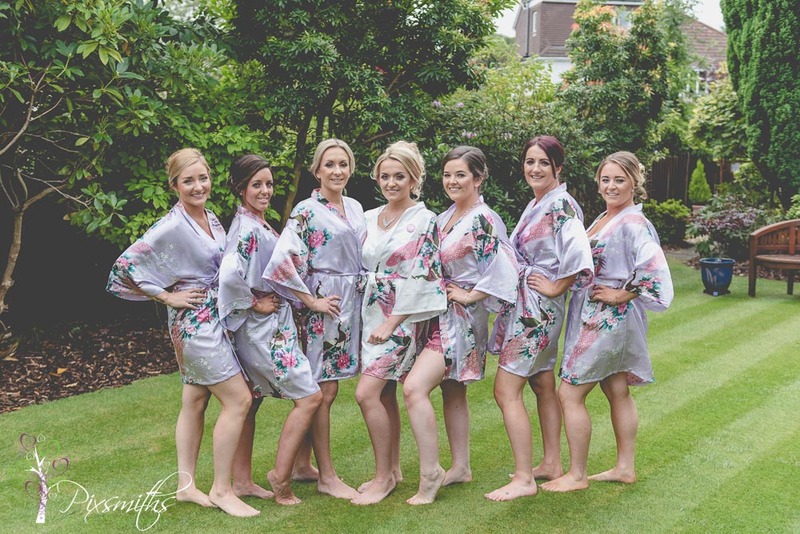 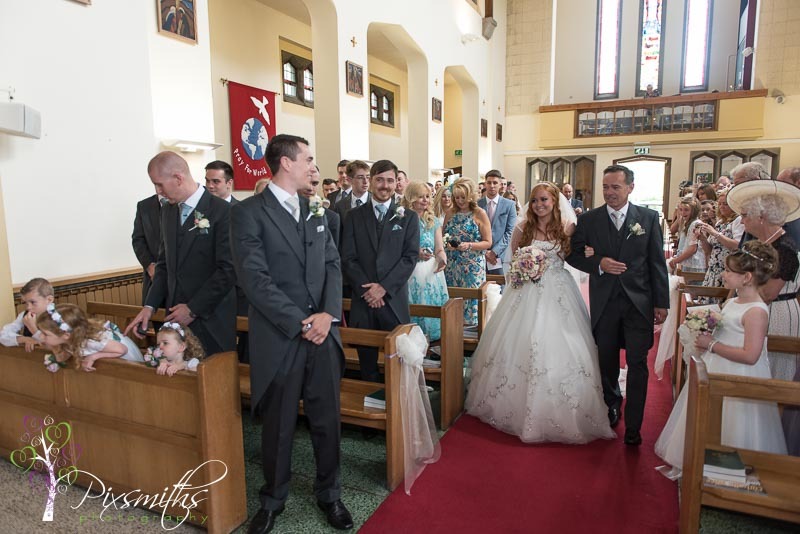 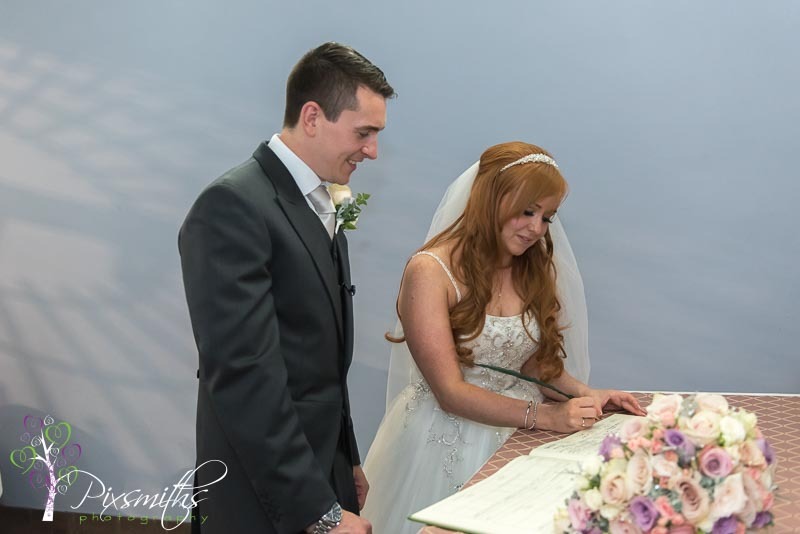 A wonderful wedding for Lauren and Craig: a church service at Christ the King in Bromborough and then down to Rowton Hall – a firm favoutie for a Cheshire wedding with Pixsmiths Creative Photography. 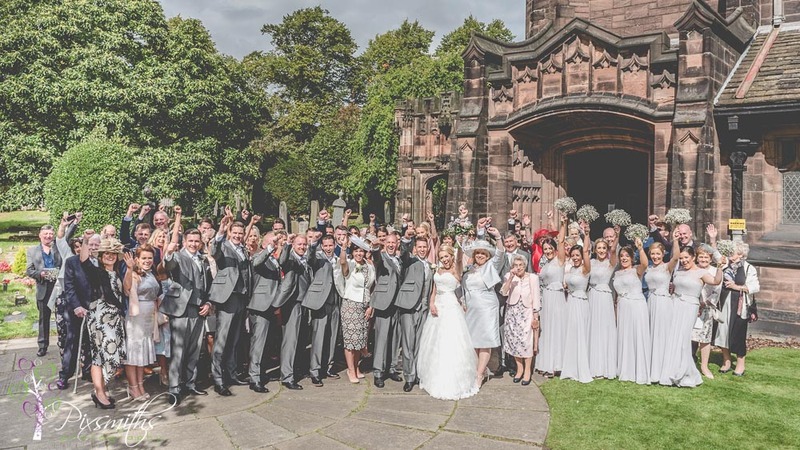 A great group of suppliers in attendance too to make this a memorable day for Lauren and Craig. 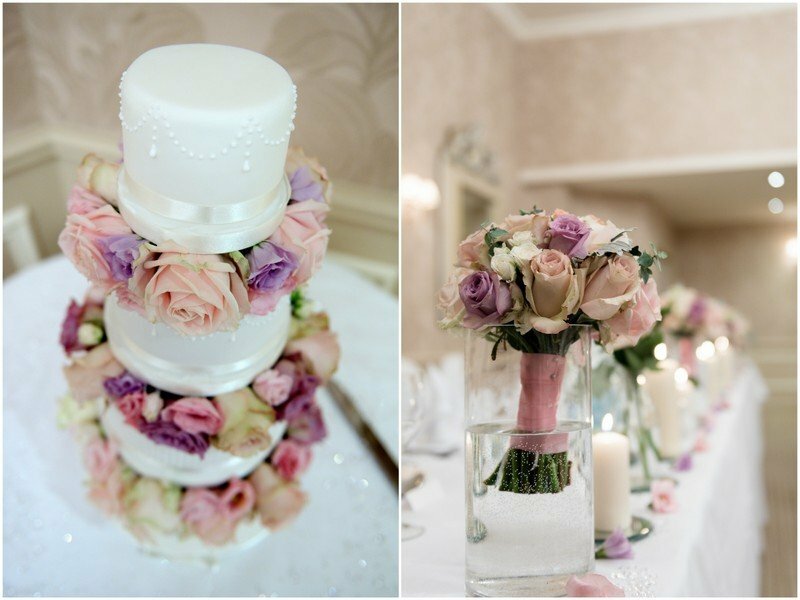 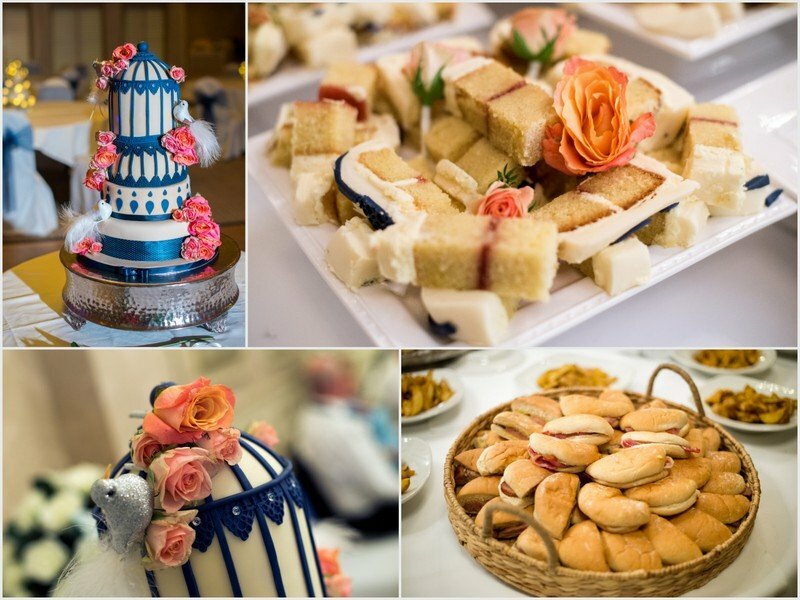 we were delighted to Have our Blue Orchid Booutique buddies supplying the flowers and cake – courtesy of Bell’s Cake Pantry. 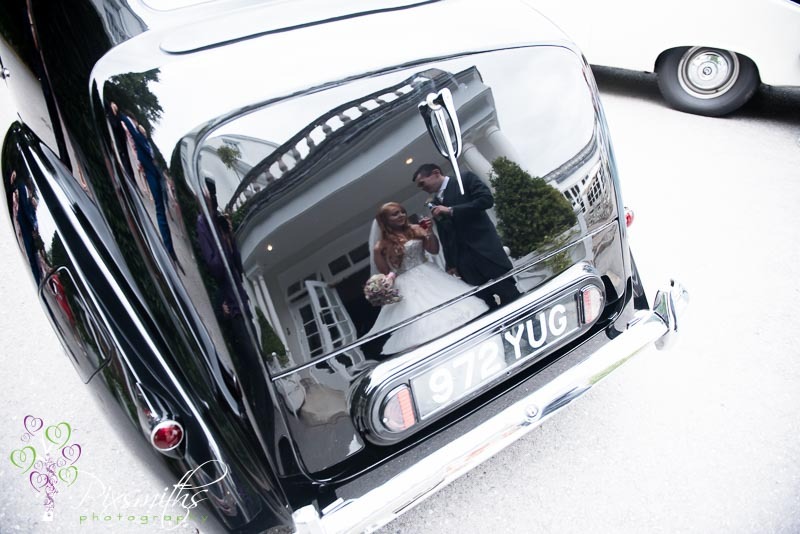 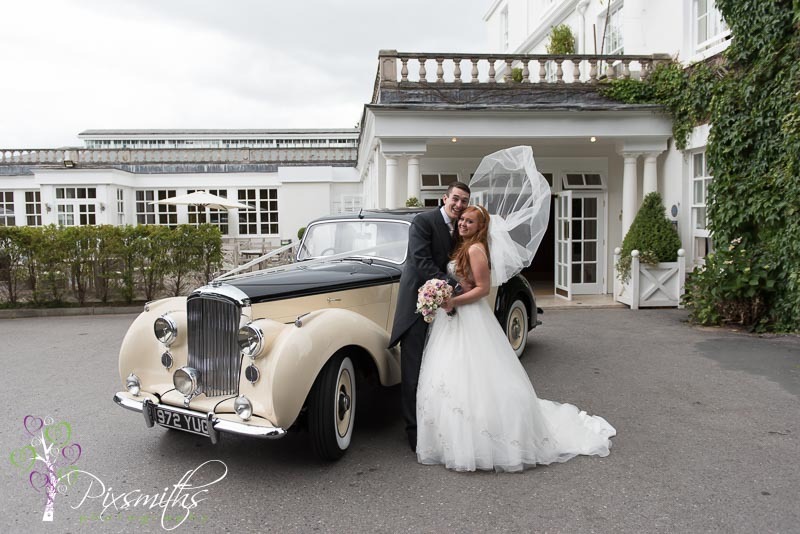 Classic Bridal Car also provided the transoprt – the new confetti cannon and the Baby Bentley proved very popular! 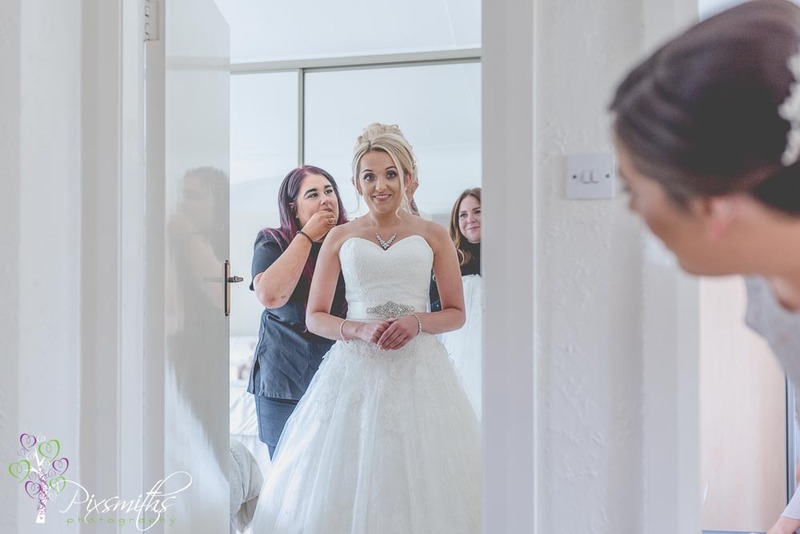 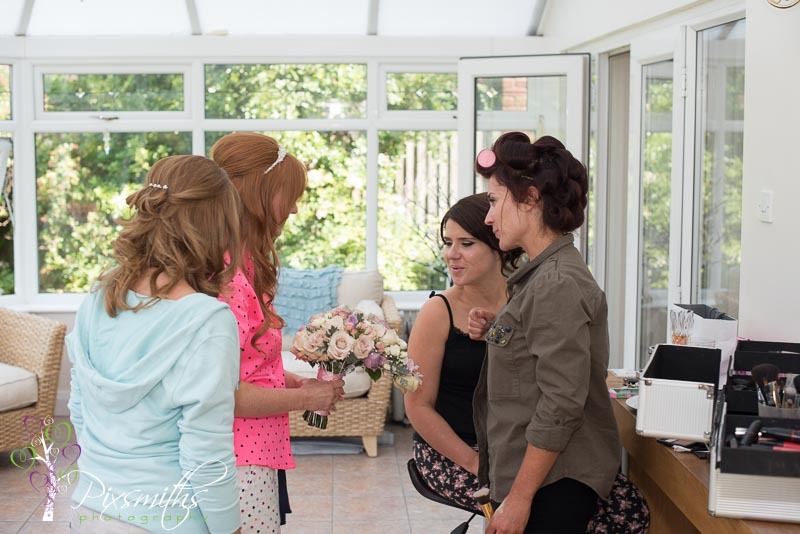 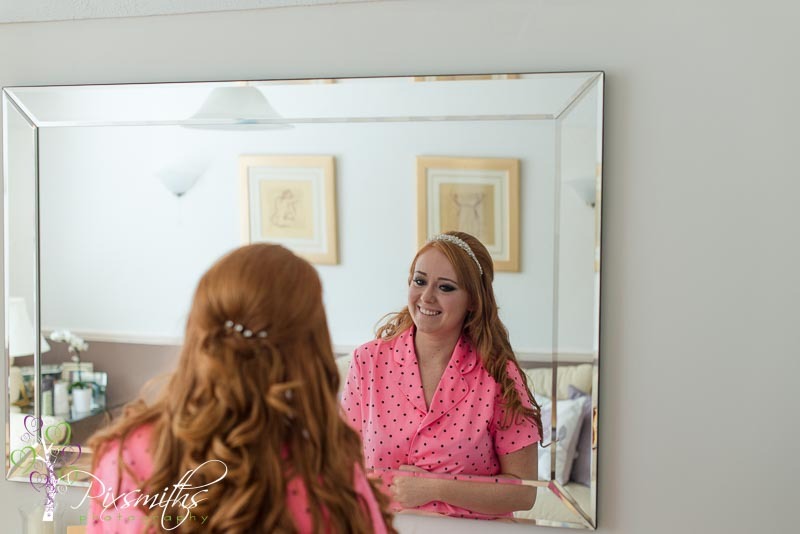 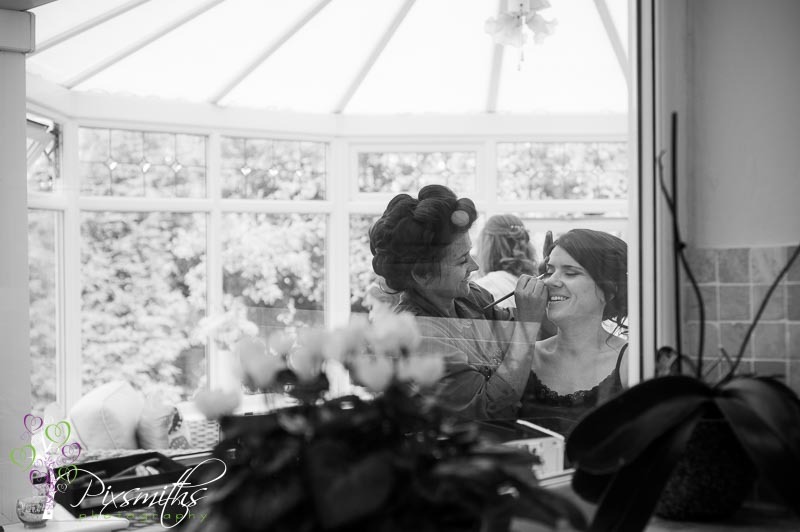 The day started very calm and chilled out at the bridal preps – bridesmaids were getting make up done and then coming to the house so plenty of time to capture details. 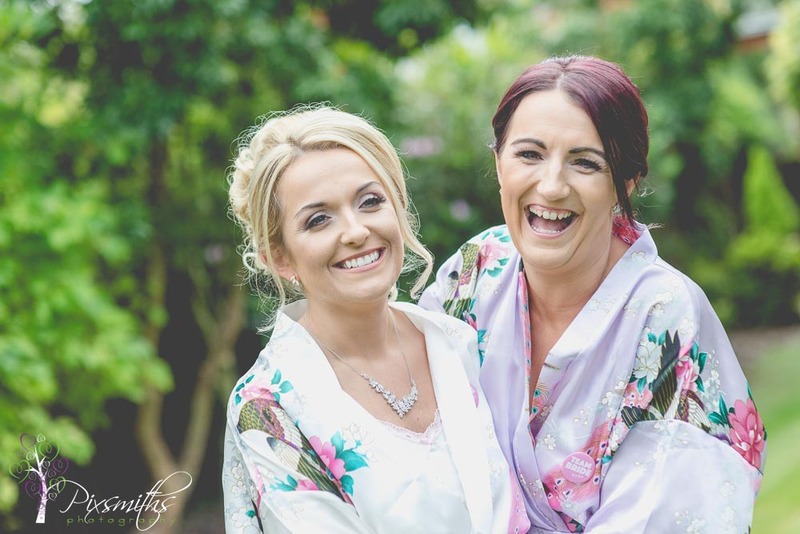 When the girls arrived they loved their silk robes and we captured some shots with them before it was time to head to Christ the King. 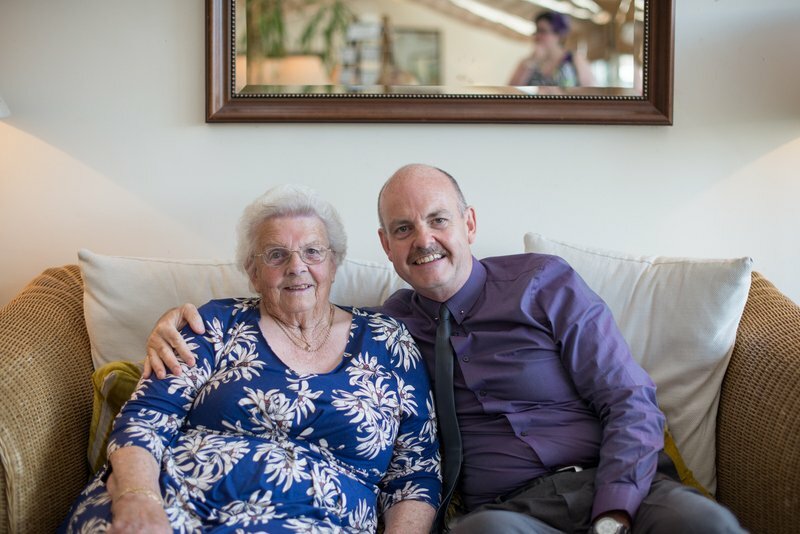 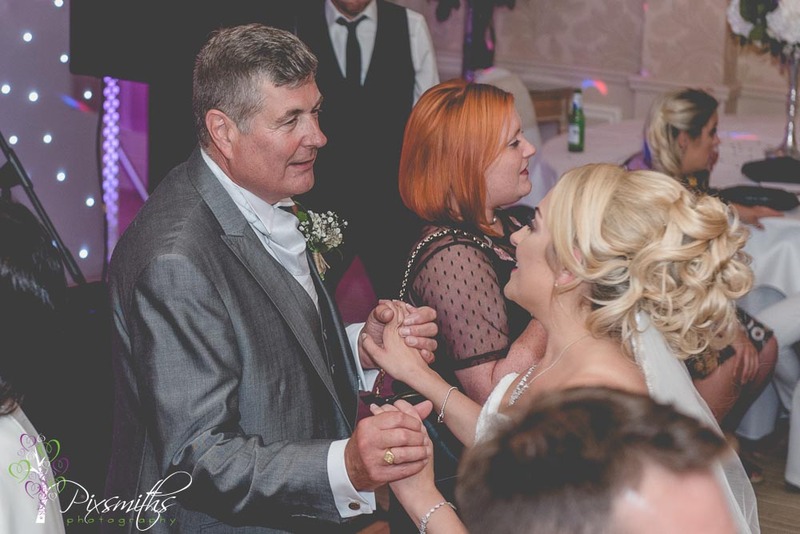 We were s o happy for Craig that his Dad could attend the ceemony, it meant so much to him, a big thank you to his carers for looking after him during the long service and afterwards for some important pictures. 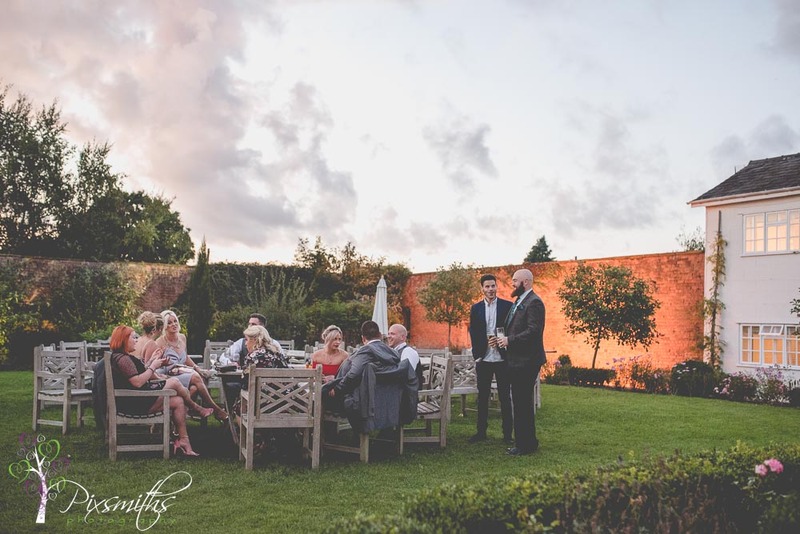 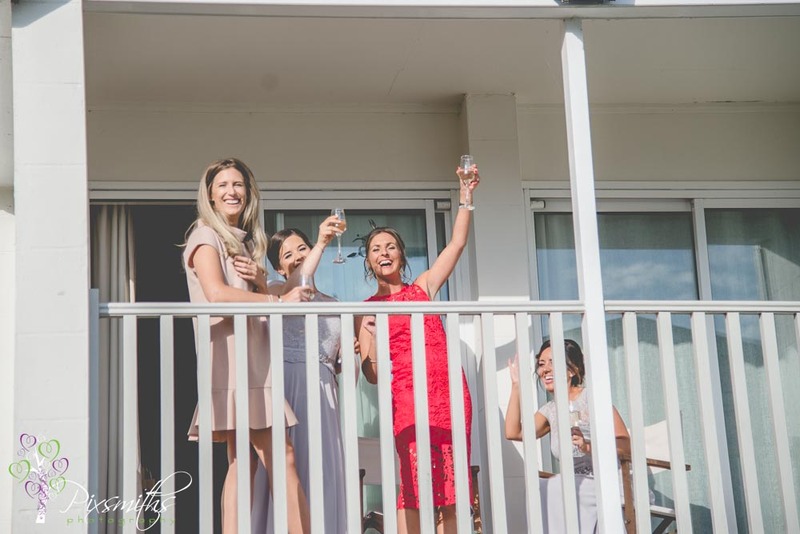 Sunny weather meant guests could enoy drinks and nibbles outdoors before the wedding breakfast. 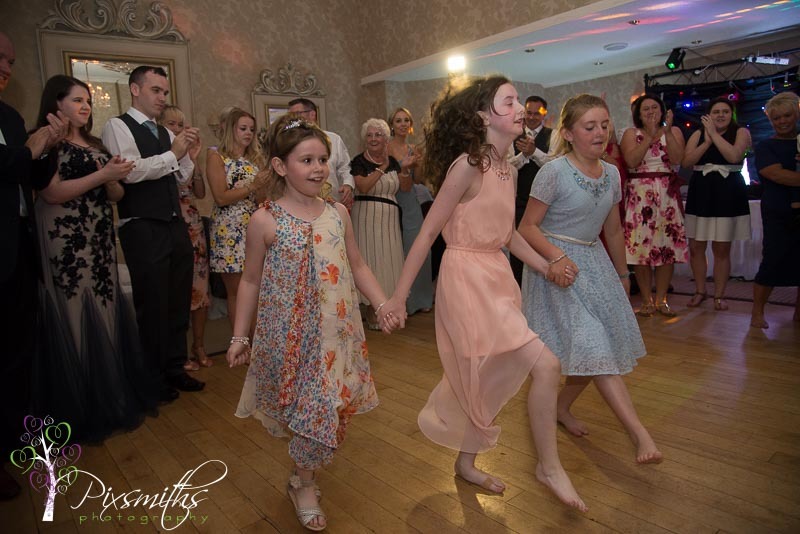 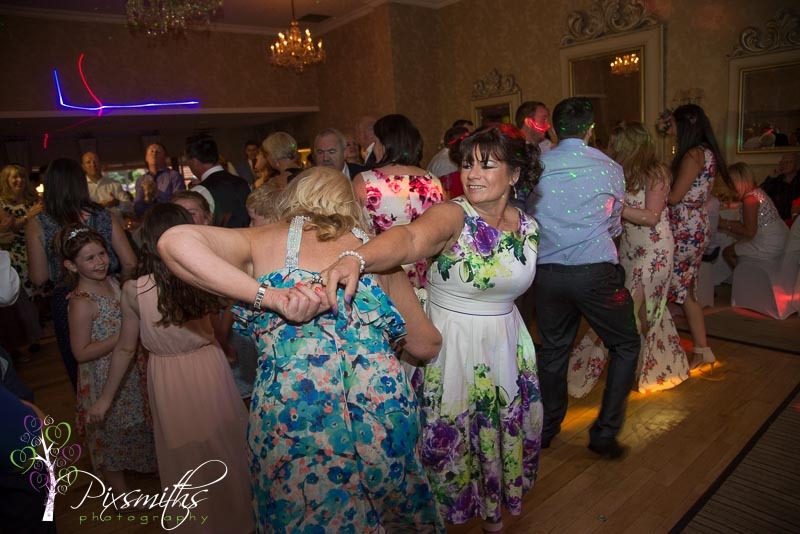 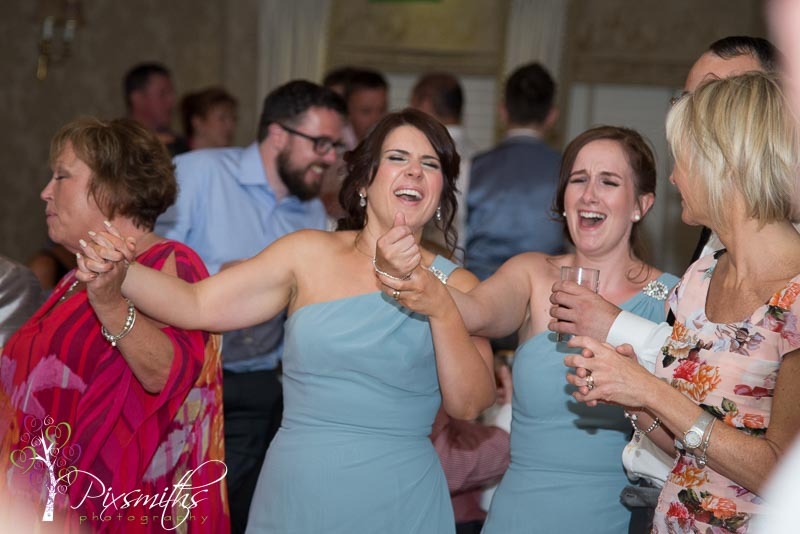 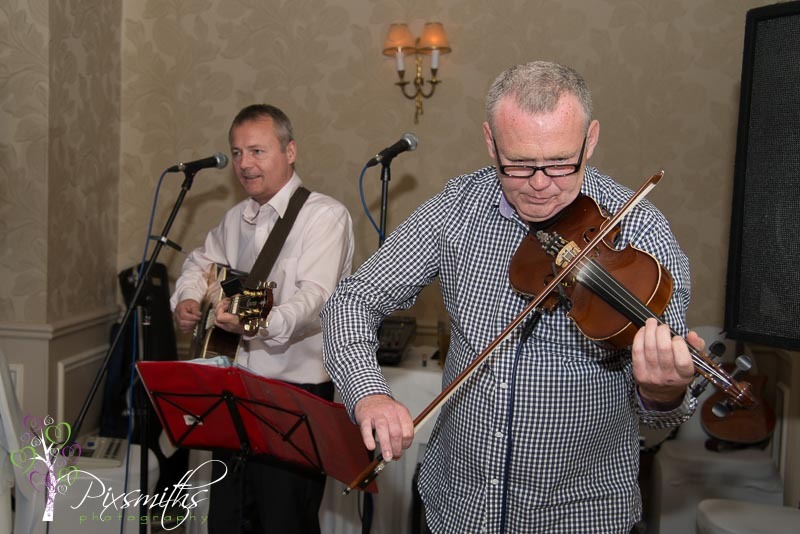 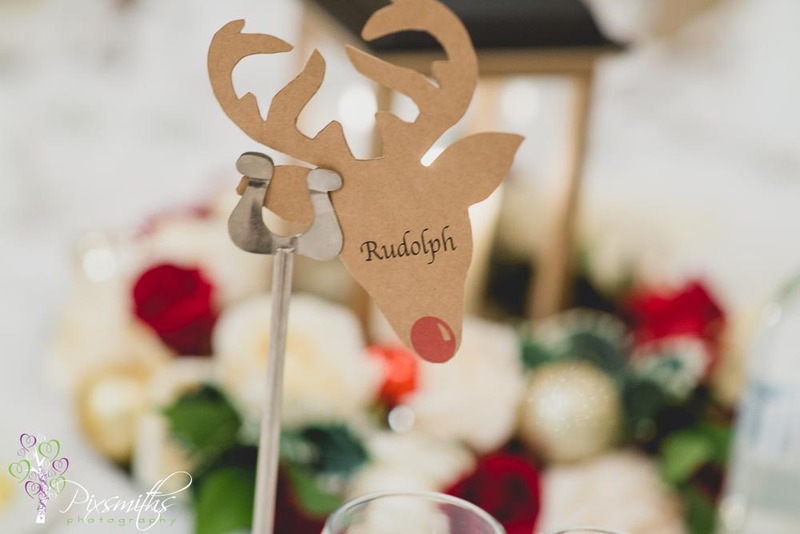 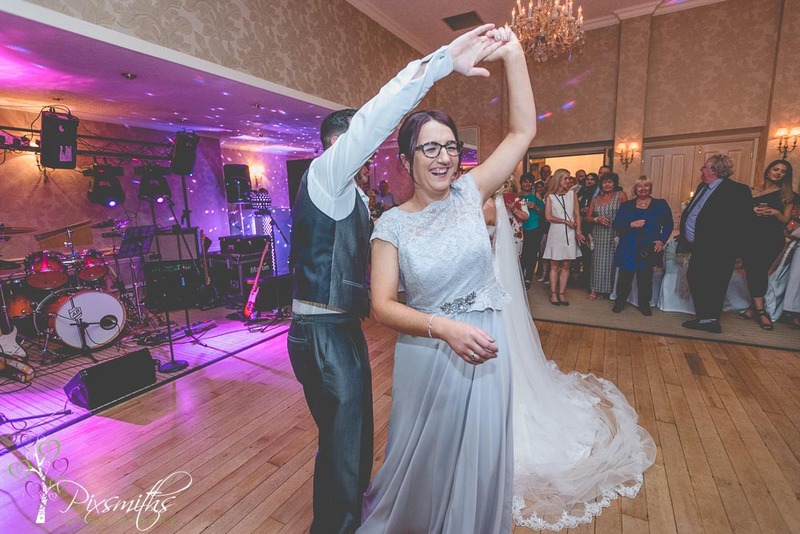 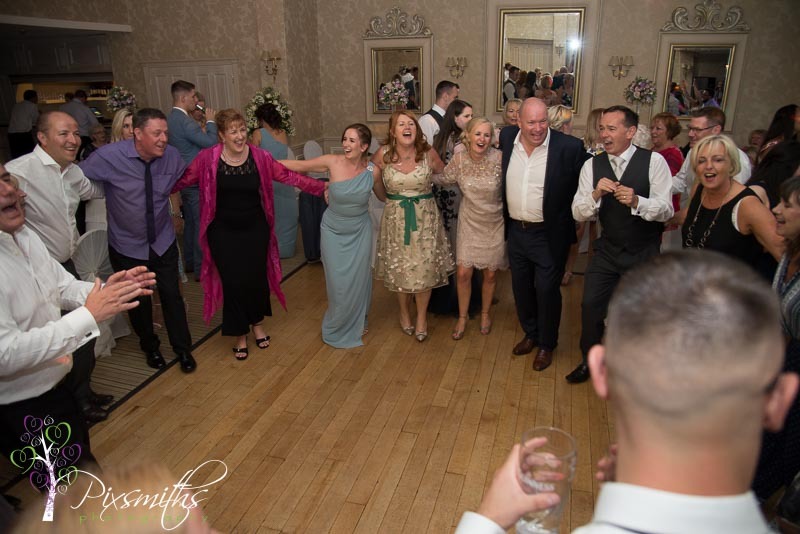 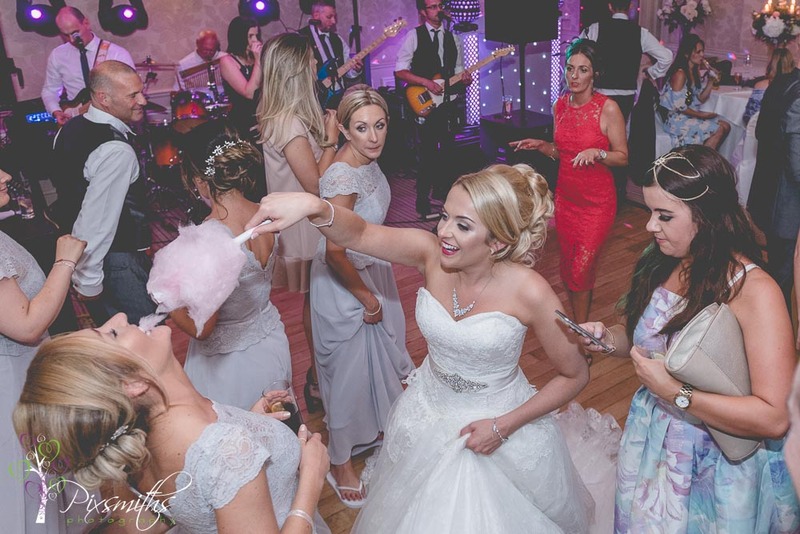 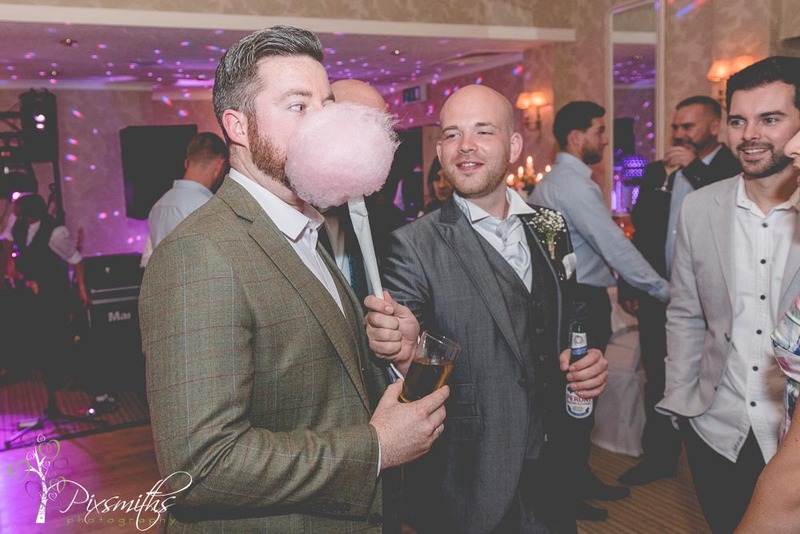 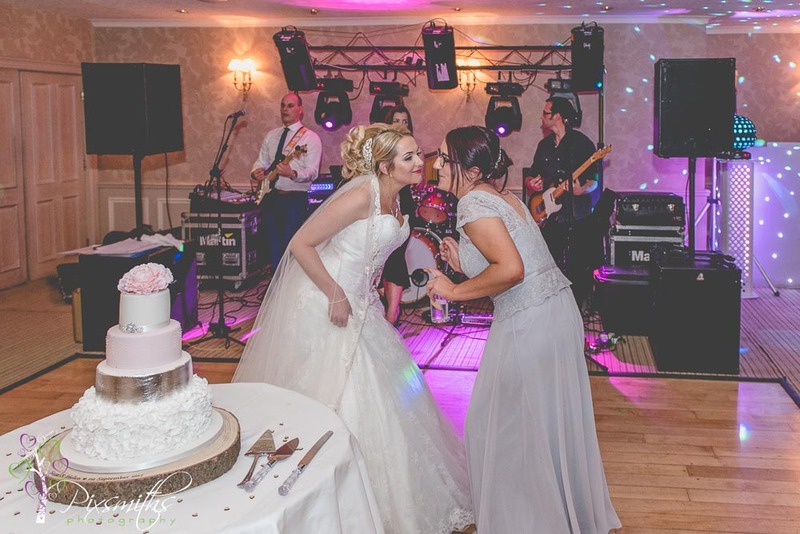 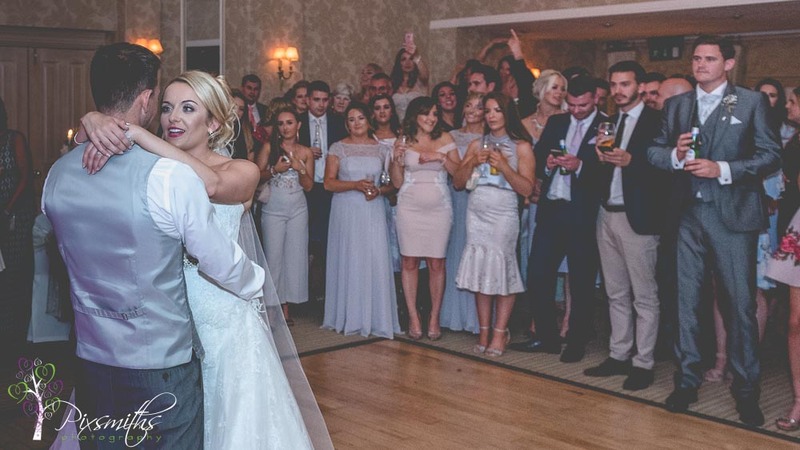 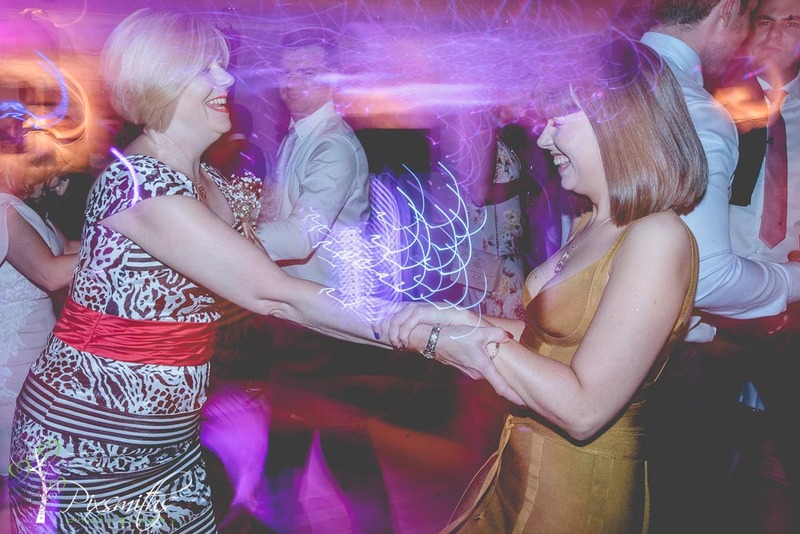 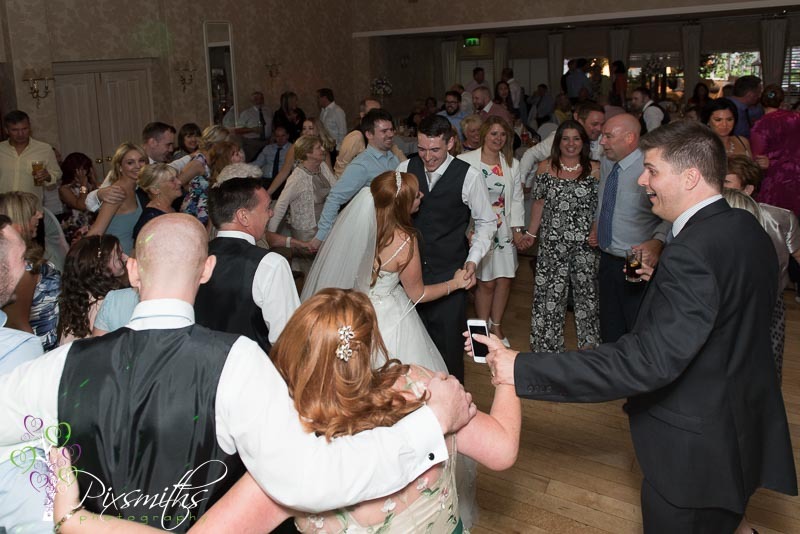 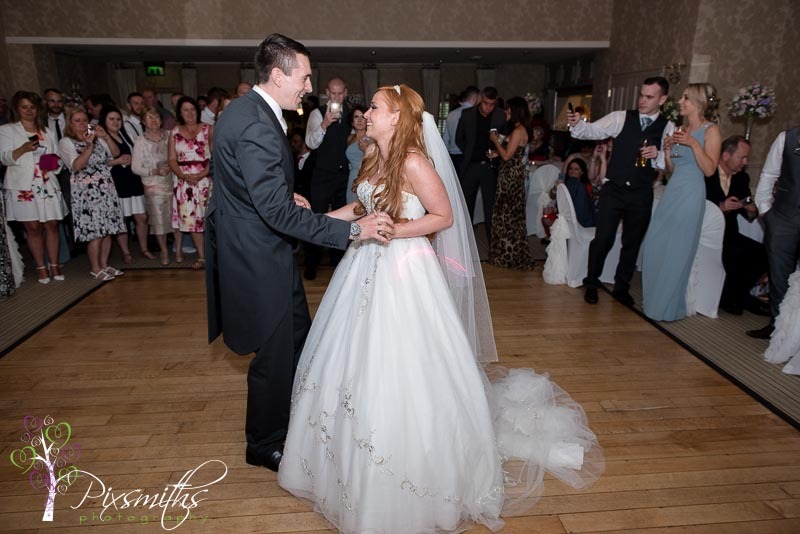 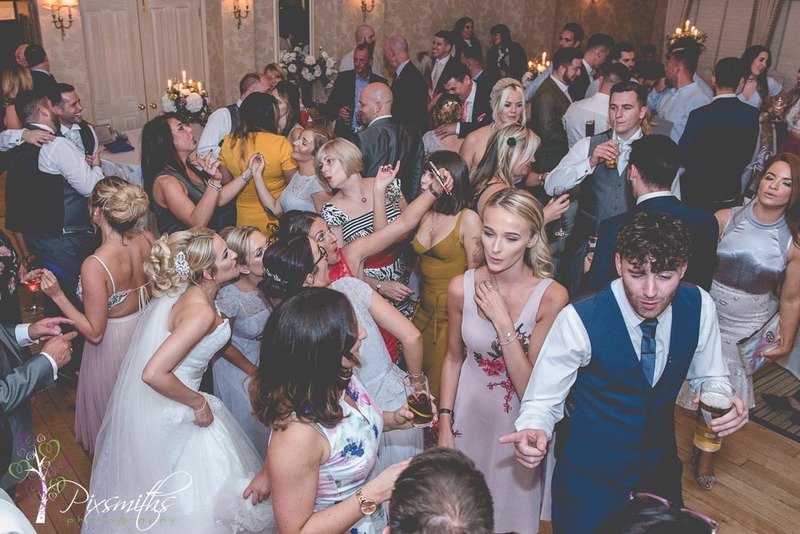 A good old Irish knees up ensued in the evening – great party atmosphere – all wonderfully captured by Rob Whibley of Acion Wedding Videos – his unobtrusive style goes very well with our natural approach. 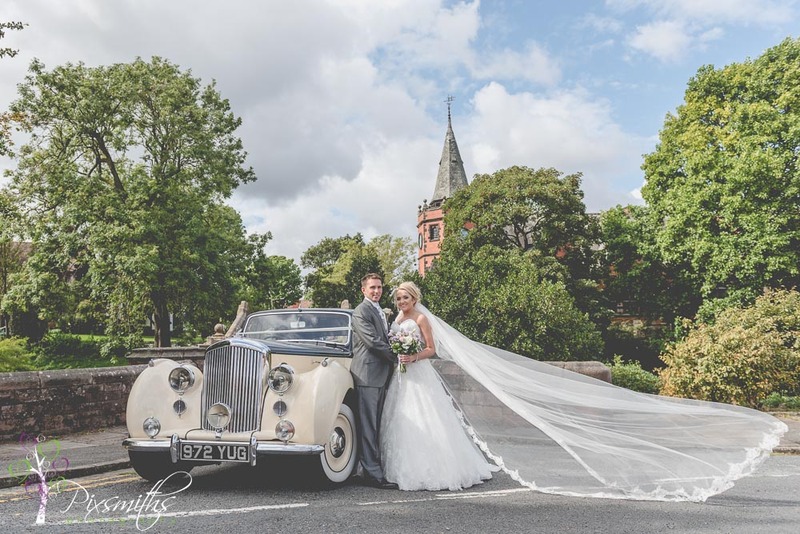 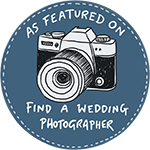 A rare treat for Wirral wedding photographers. 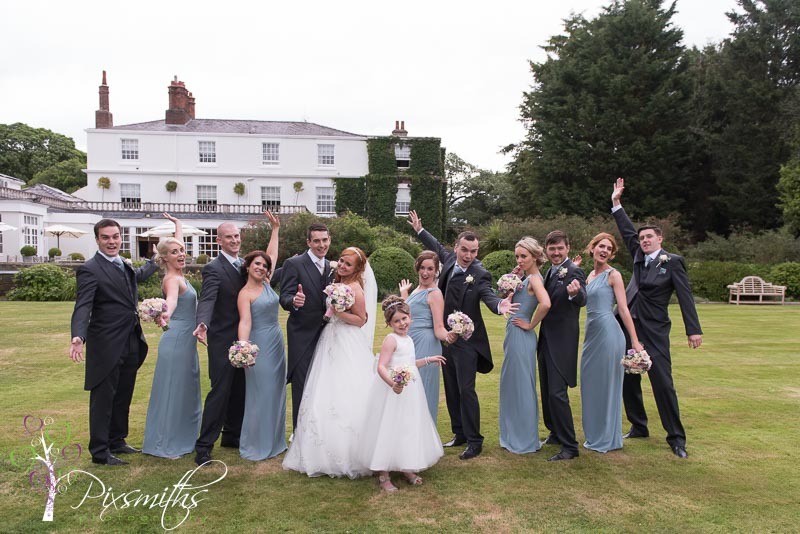 Guests at Rowton hall hotel for a family wedding! 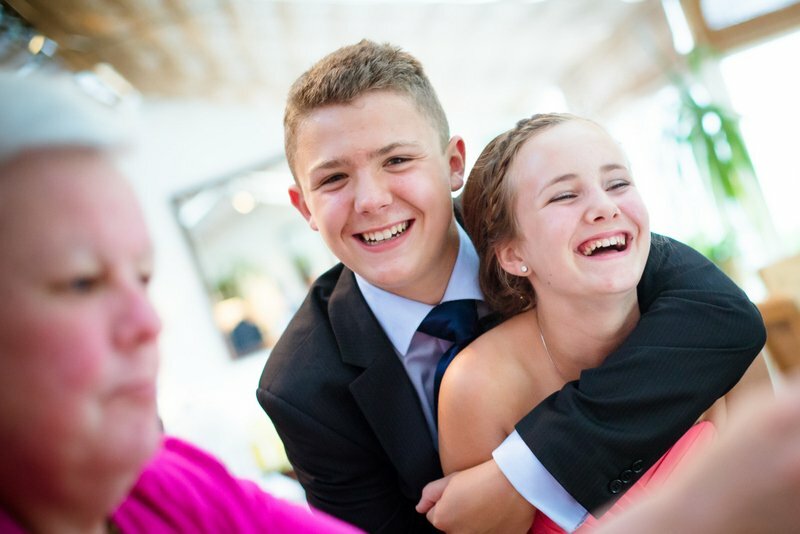 Hayley and Callum are second cousins to Dave (I think!) 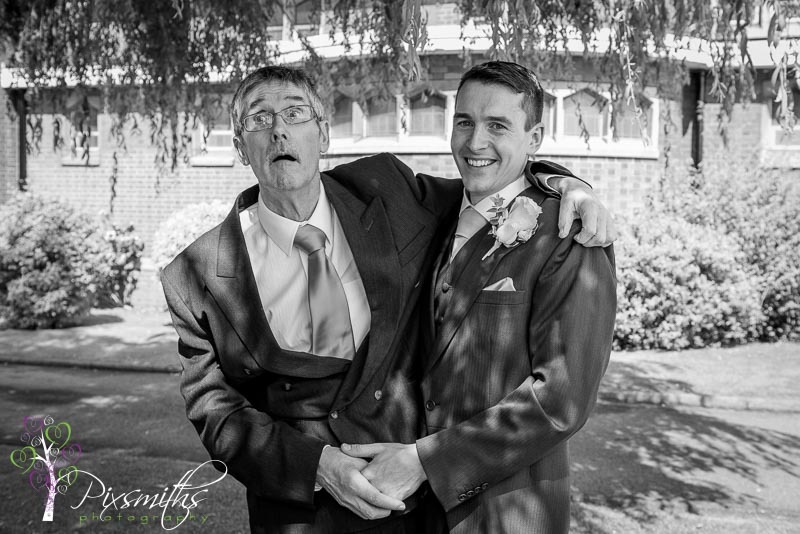 Great time to relax and enjoy being with family and let someone else take care of the photography. 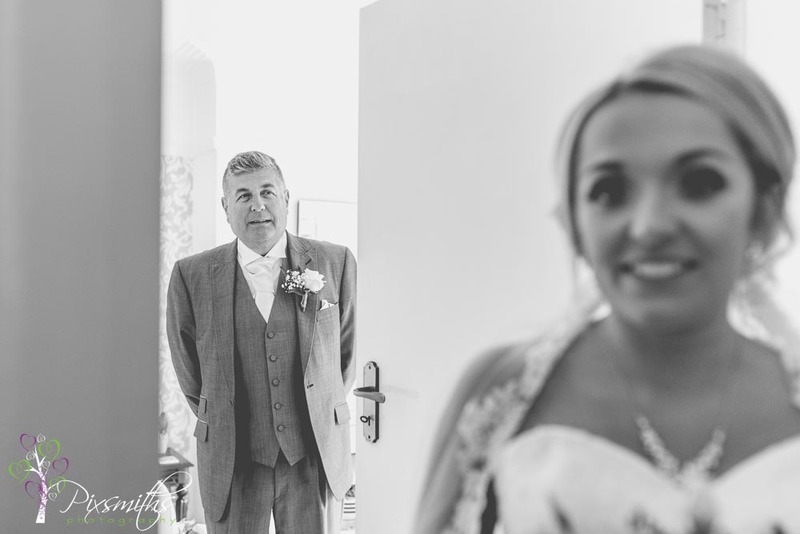 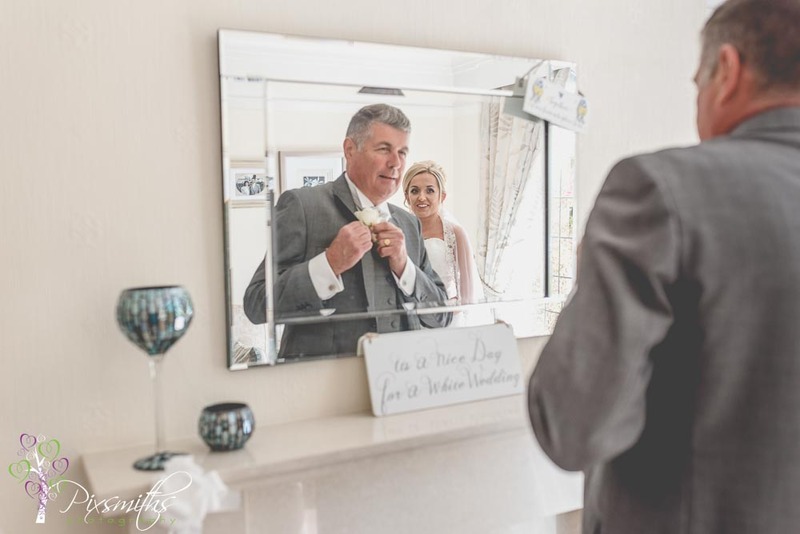 As family we wanted to be able to relax and enjoy the moments with the couple, weddings days can be stressful for a photographer and you constantly have to be on the watch to catch those incidental moments that everyone loves. 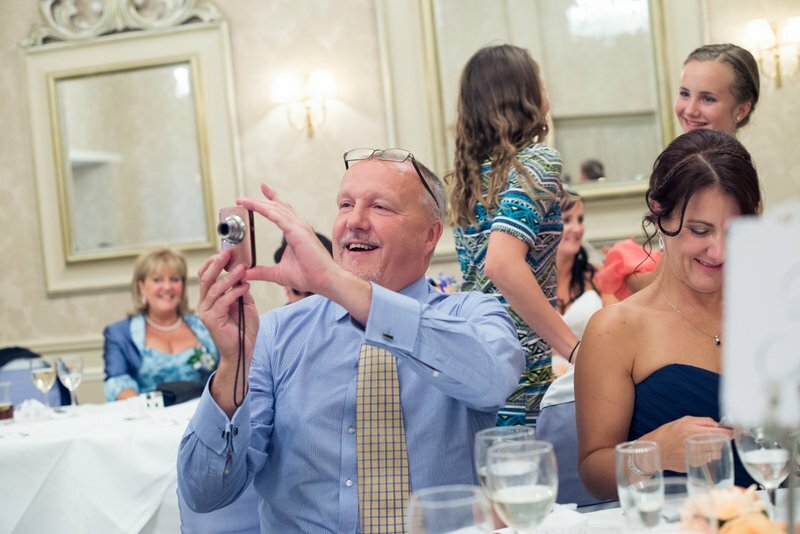 For this reason we will rarely cover a family wedding. 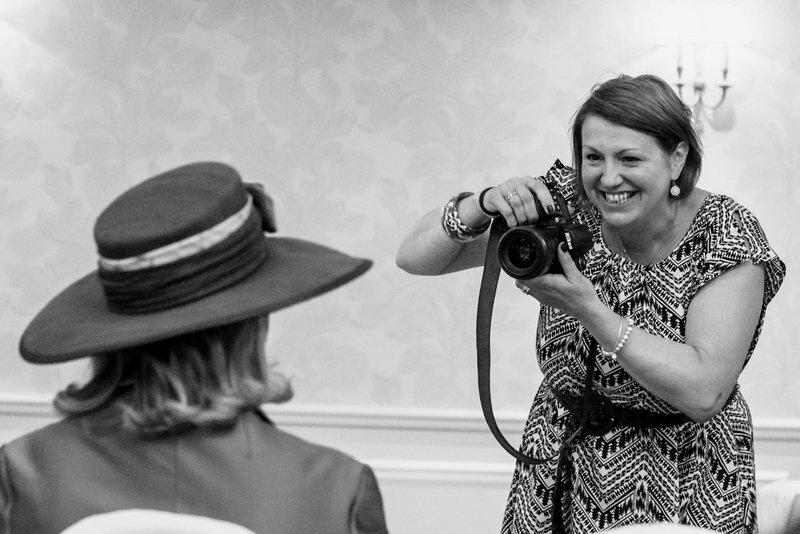 Wonderful to have the very talented Andrea Ellison be the photographer for the day. 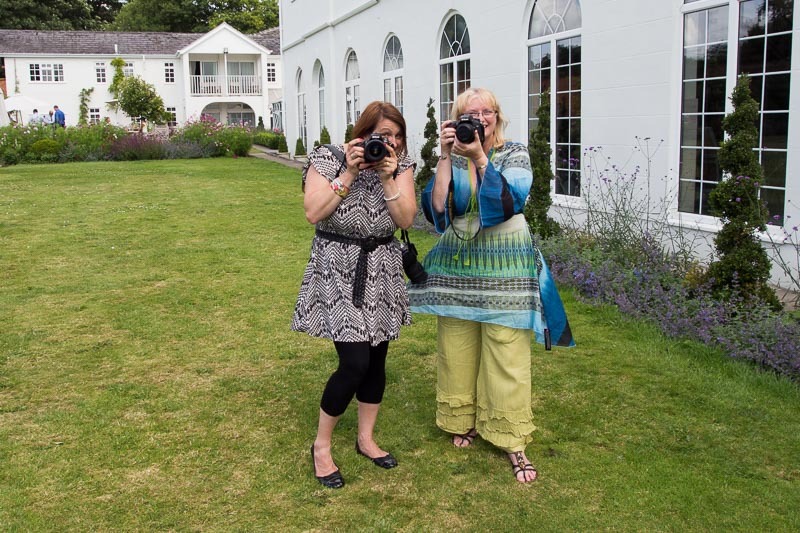 Great to meet at last have a bit of a chin wag – hope we didn’t stop you too much but I know you will have amazing images and look forward to seeing them. 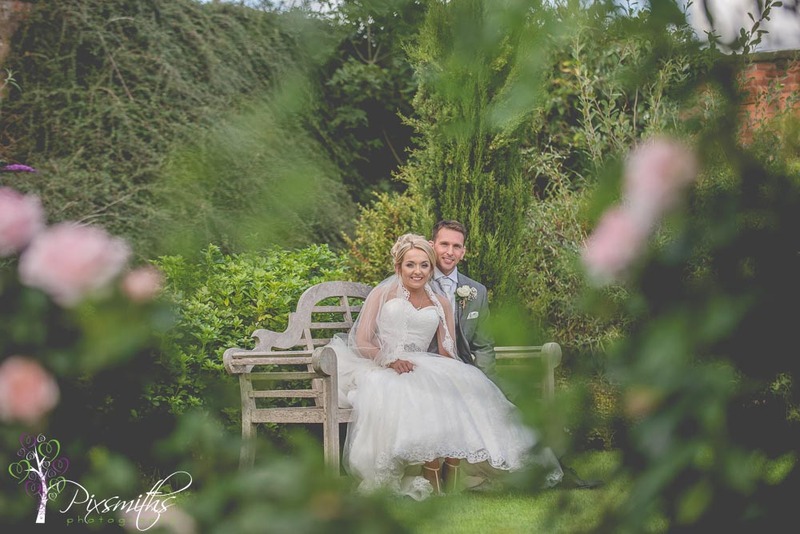 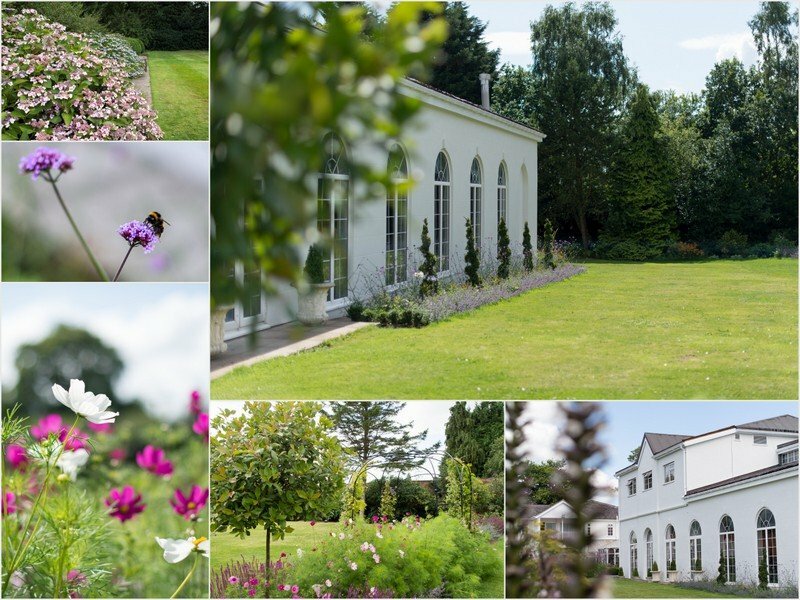 Love this hotel and during our time here we were delighted to see the improvements in the grounds, gorgeous new flower beds and landscaping my mind was already racing ahead to weddings we have booked here for 2015 and the layered shots we love to do with the flora. 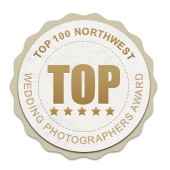 Super excited about that! 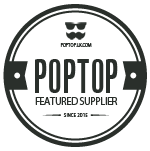 The food was scrumptios as always and the staff so organised and helpful. 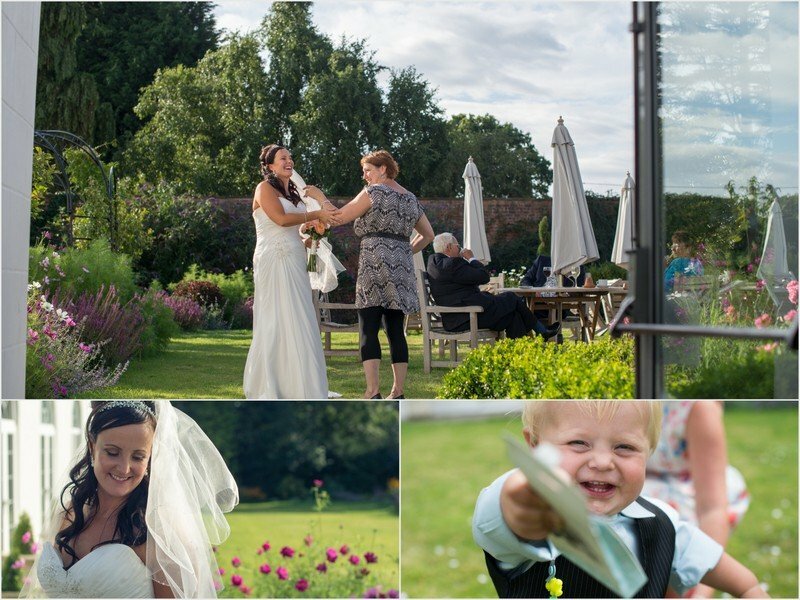 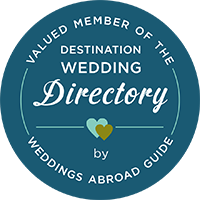 If you are palnning or have booked your wedding here oh wow are you are in for a treat ! 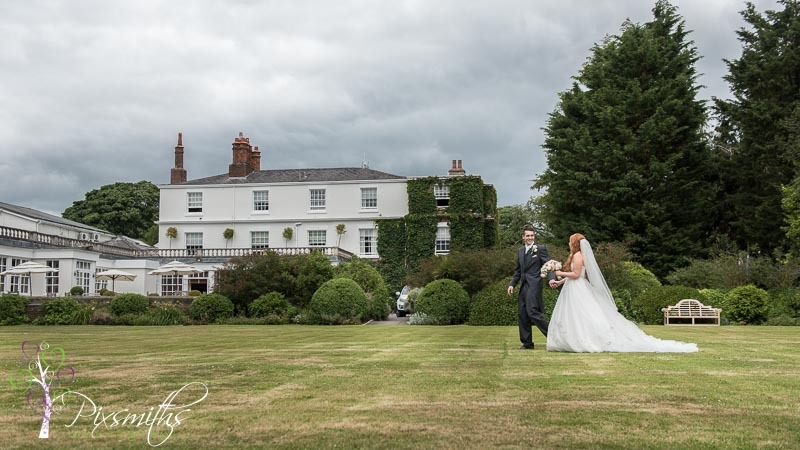 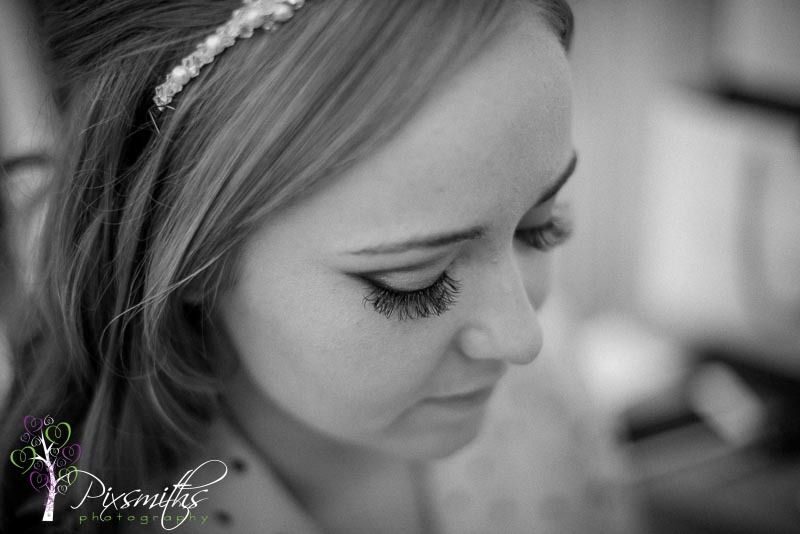 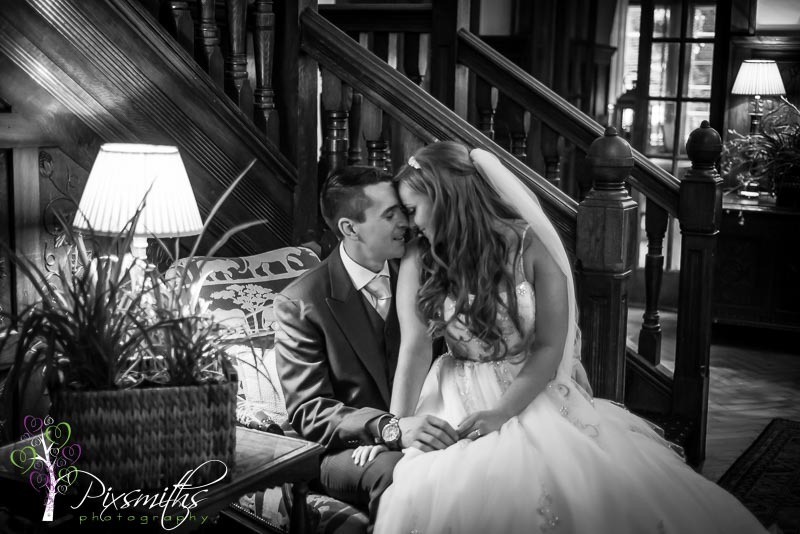 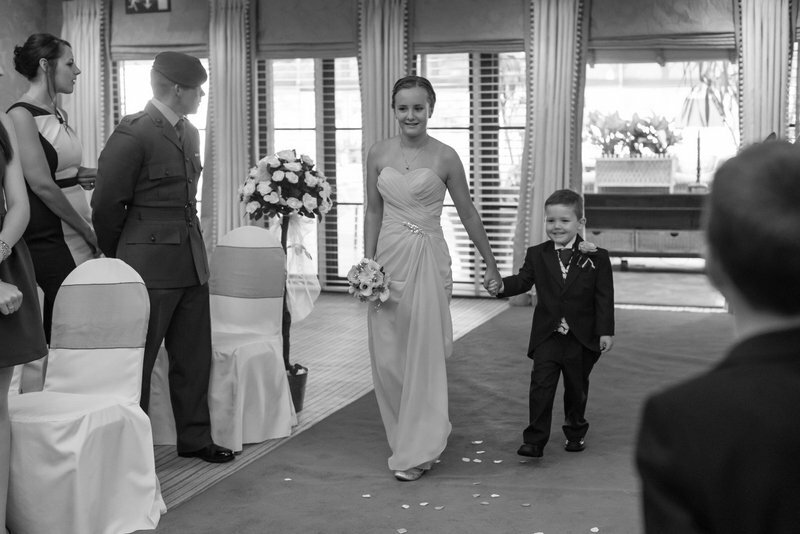 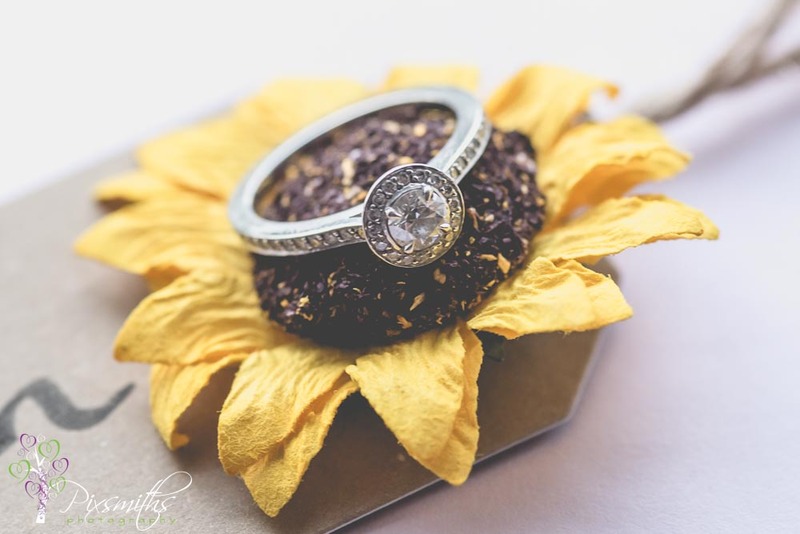 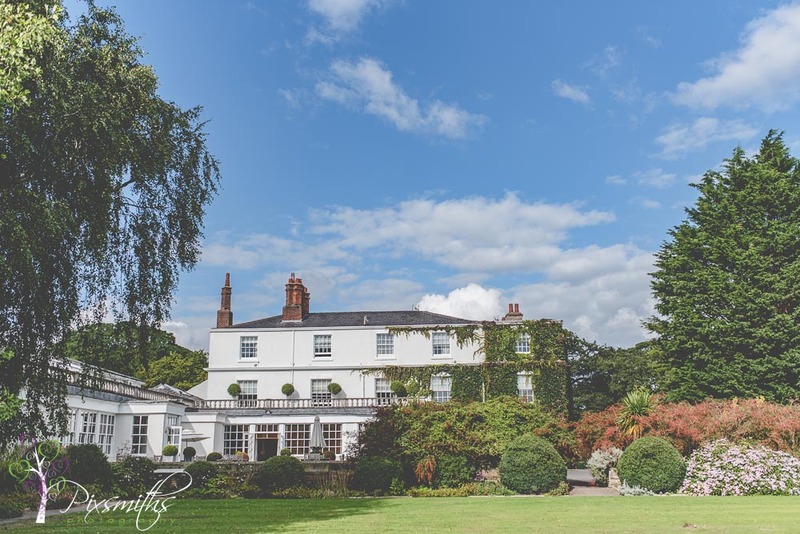 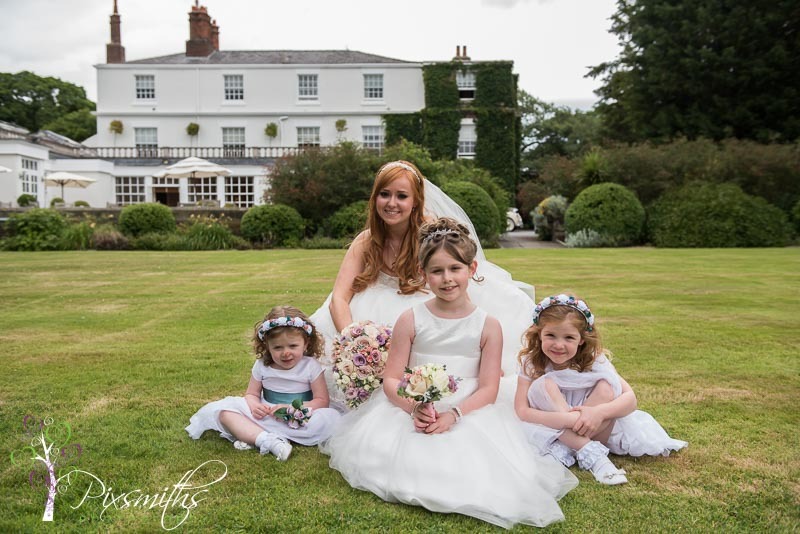 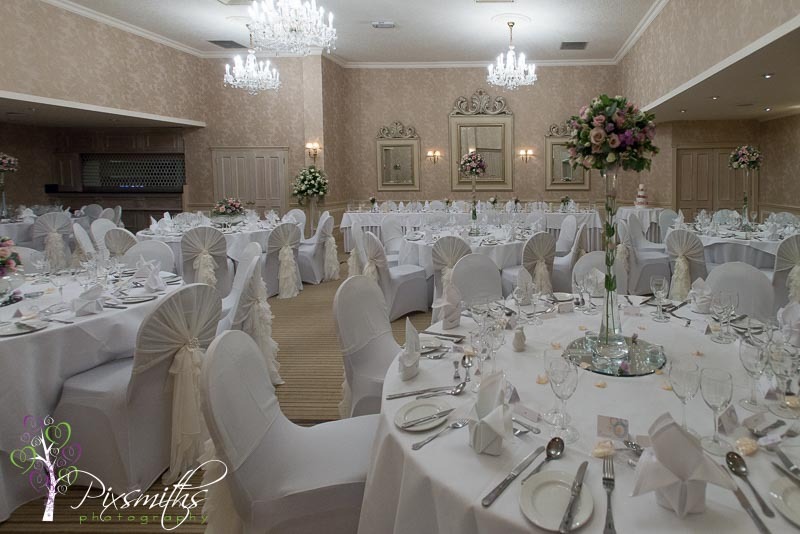 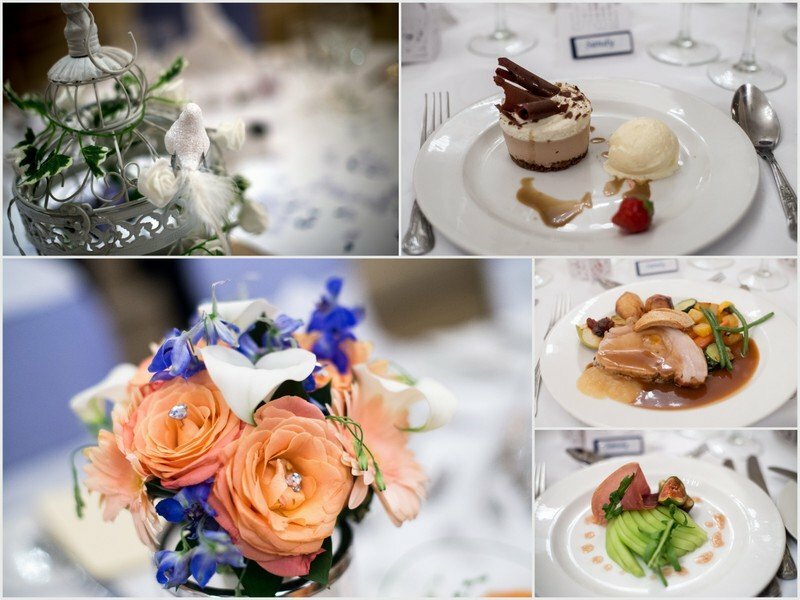 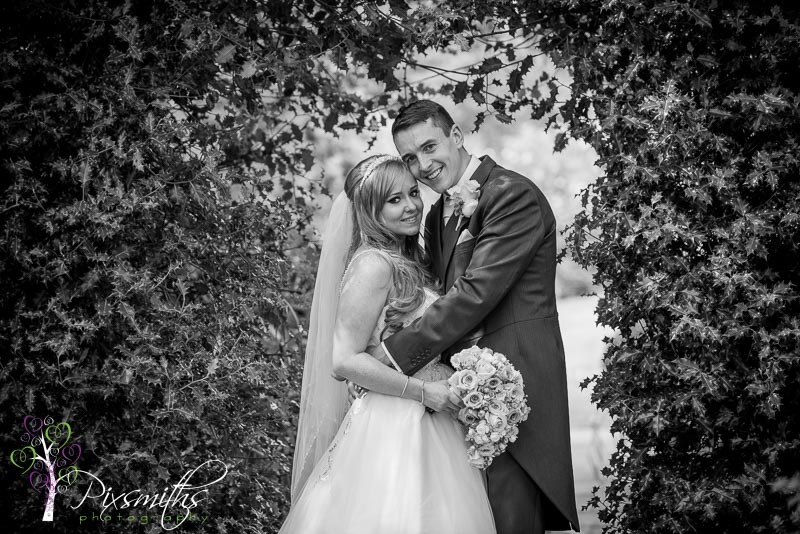 If you would like to discuss your Rowton Hall wedding photography with us we’d be delighted to hear from you. 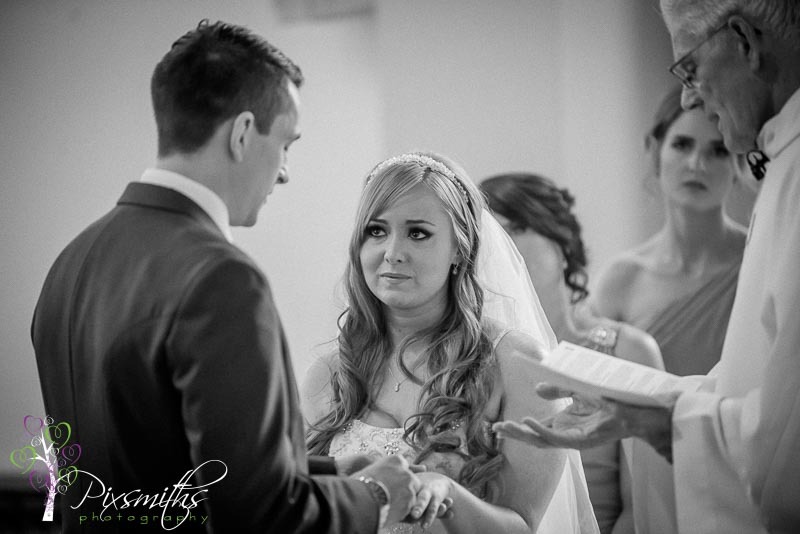 Below some random pictures from the day. 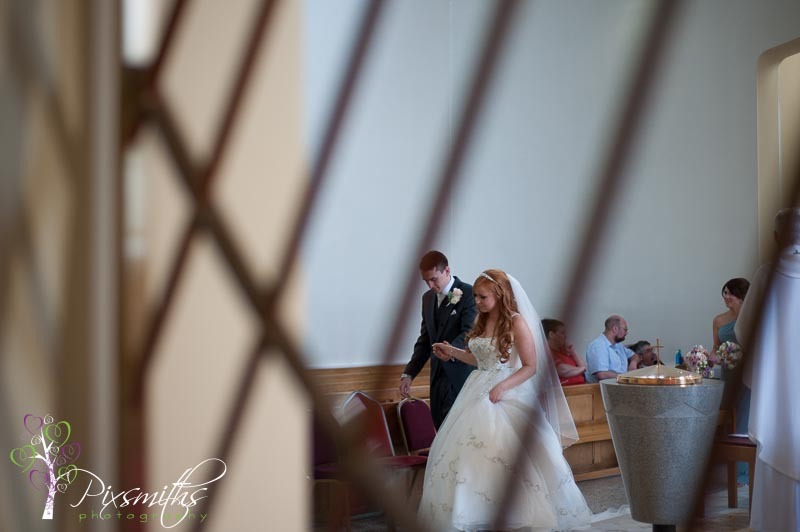 can’t wait to be back here!